Welcome to the home of the Peirce Edition Project! Our online doors are always open. Come inside, don’t shut your eyes, but open your mouth perhaps, and on each page Peirce will give you something pithy to make you wise. Experience is our only teacher, he said. May Peirce be your experience. Charles S. Peirce (1839–1914) is recognized worldwide as one of humanity’s most rigorous, versatile, and seminal thinkers. That he is the principal originator of the philosophical movement called pragmatism is only one of his titles to our collective gratitude. He is also regarded as one of the most fundamental inquirers ever. The range and power of his contributions is such that he has become a stimulating influence on philosophers, humanists, social scientists, and hard scientists on every continent. He left behind a large corpus—more than twelve thousand pages in publications and about eight times as many pages in unpublished manuscripts—that covers all manner of topics in the sciences (including mathematics, geodesy, physics, chemistry, and astronomy) and the humanities (including logic, philosophy, semiotics, metaphysics, cosmology, history of sciences, linguistics, lexicography, and psychology). Established in 1975–76, the Project’s long-term aim is to produce a 30-volume print edition of Peirce’s writings as well as an electronic edition embedded within a collaborative research platform. Writings of Charles S. Peirce is a selective but comprehensive chronological and critical edition designed to document the development of Peirce’s thought in every area and promote the critical study of his intellectual growth and interdisciplinary reach. Our website provides information about all aspects of our activities. Use the top and side menus to find answers to many questions. Who are we? What do we do, how, and why? What is our mission? What are our responsibilities? What is our history within the longer history of publishing Peirce? Who do we work with? What have we published? What are our resources and how do we make them accessible? Is it possible to visit the Peirce Project for short or long stays? What are the methods that distinguish our critical edition from other editions? How do we reorganize the Peirce manuscripts? How do we select and edit them? What makes Peirce significant and so formidably relevant to our century and beyond? What is the Project’s plan for the online dissemination of Peirce’s works? What are the technologies we are developing? 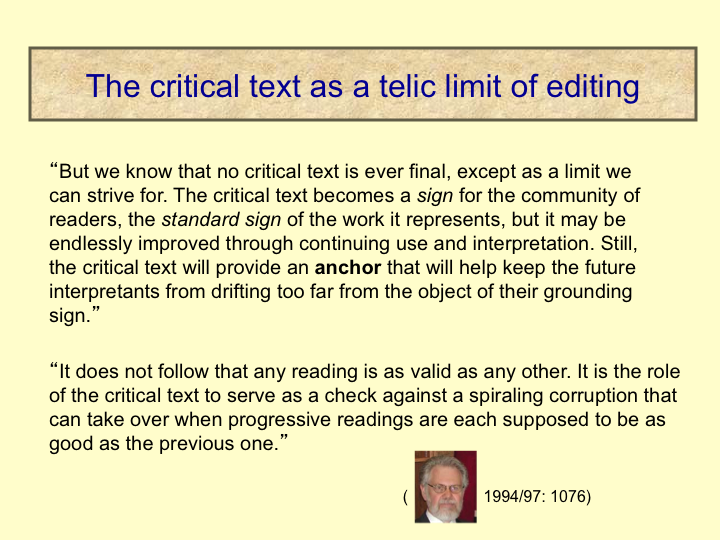 How do we conceive the role of critical editions when they are ported online? How is the Project being supported? How can you help? How to contact us? Feel free to explore and click the links that connect you to some of our resources. 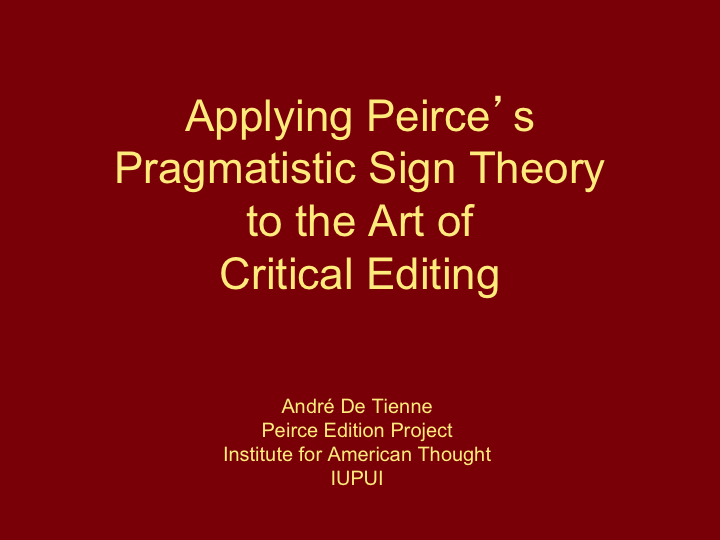 The Peirce Edition Project is a core unit of the Institute for American Thought (IAT), a “Signature Center” in the Indiana University School of Liberal Arts. The IAT focuses especially on American contributions to philosophy and the humanities (Peirce, Royce, Santayana, Douglass, Bradbury) and to the advancement of thought at the highest intellectual level in Western culture. Recognized as a “We the People” project by the National Endowment for the Humanities, the Peirce Edition contributes to the Institute’s shared goals of producing reliable new texts for seminal American thinkers through a professional editing process that preserves their writings for future generations, and of facilitating the understanding and dissemination of American thought and culture through the promotion of teaching, research, public lectures, and participation in conferences. Our mission is to fulfill the wish Peirce expressed in the epigraph above, which ended his review of A. C. Fraser’s book on Locke. We reconstitute, reorganize, edit, and publish the prolific writings of American scientist and philosopher Charles S. Peirce, one of the world’s foremost thinkers, who spent his entire life researching the fundamental laws governing not only scientific reasoning and rational inquiry in the major domains of human knowledge, but also natural processes at all levels. Since 1976, the Project has been producing a multi-volume chronological and critical edition of Peirce’s writings. The projected number of volumes has varied over the years but has long been set to thirty following a general assessment of the entire corpus, taking into account a comprehensive preliminary dating of the entire documentary base, the distribution of manuscripts across the years, their topical range, and their plausible publishability. Seven volumes have so far been published (vols. 1–6 and 8). The current plan is to continue the print edition while also developing a digital edition. The highest standards of scholarship govern the production of the Writings of Charles S. Peirce. The Writings are a selective but comprehensive edition designed to document the development of Peirce’s thought and promote the critical study of his intellectual growth and interdisciplinary impact. 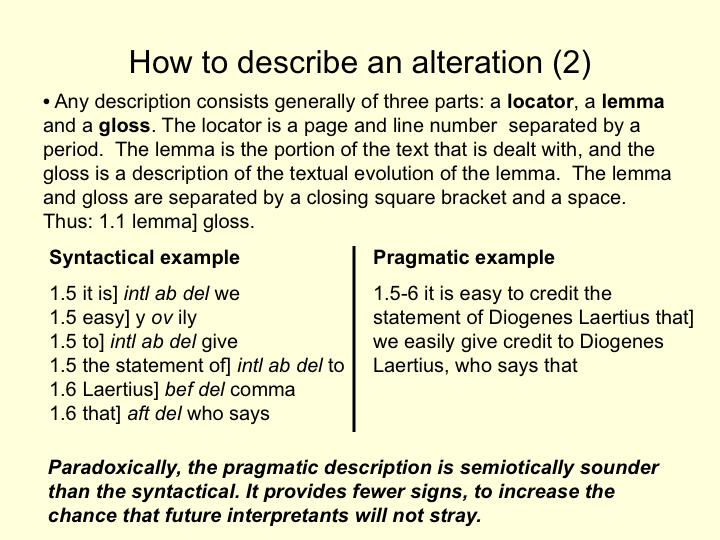 All texts undergo an exacting critical-editing process that includes multiple stages of proofreading and error corrections, consultations with specialists, and applications of a textual-theory-informed, consistent set of editing procedures vetted by inspectors of the Modern Language Association’s Committee for Scholarly Editions. All text transcriptions and products of scholarly and editorial work are encoded following the markup guidelines developed as an international and interdisciplinary standard for humanities texts by the Text Encoding Initiative Consortium (TEI). The TEI keeps developing highly adaptive encoding modules supporting the tagging of particular textual genres (speech, drama, poetry), and structures, including manuscript description and transcription, editorial apparatuses, dictionaries, bibliographies, and graphics. We develop partnerships with other scholars and research centers in other institutions whenever a justified opportunity presents itself. We provide fully reliable textual resources produced according to highest standards of accuracy that the general public, the student population, and specialists can access and use in ways that advance their own research, satisfy their own interests, and inspire them to improve the expression and testing of innovative ideas. To this end we are designing and developing an online production platform called STEP (Scholarly Text Editing Platform), funded in part by the National Endowment for the Humanities, that will enable the Project, and any other digital edition, to transcribe, edit, and publish the works of great authors while meeting highest professional standards of accuracy and presentation. Inside academia, we seek to integrate scholarly imperatives of dissemination with the need of researchers to communicate their findings to the right target audience while also receiving appropriate credit for their contributions. We also want to ensure that instructors and students have adequate interactive access to the products of our editions in ways that enhance the methods and experience of teaching and learning while stimulating the creation of fruitful lines of inquiry. Outside academia, we seek to offer unrestricted access to textually reliable and trustworthy materials to every person animated by a genuine desire to learn. Scholarly editions can become powerful and positive enablers, offering the astonishing insights of significant thinkers and writers. To this end, we design new tools of online dissemination and collaborative inquiry intended to enlarge the range of research and enhance the quality of access to resources in the humanities—including the writings of Charles S. Peirce and other preeminent thinkers and writers. Those new tools are part of an initiative called CORPUS, Collaborative Online Research Platform for Users of Scholarly editions. That initiative has been funded in part by the IUPUI Arts and Humanities Institute (IAHI). To learn more about these initiatives, read the section “Planning for future history” under the History submenu, and explore the “Technology” tab above. In scope, significance, and complexity, the Peirce Edition ranks among the most challenging scholarly editions in the humanities. The principal reason stems from the state and condition of the documents themselves. It is not their mass that is problematic (about 100,000 sheets of published and unpublished materials), for many archives are larger. It is rather the combination of a number of factors that include Peirce’s habits of composition, translating into constant recycling, decomposition and recomposition; the lack of dating (absent or insufficient) of a majority of documents, which calls for extensive detective research to meet the imperatives of a chronological edition; the scattering of documentary fragments across hundreds of archival folders, with the consequence that most manuscripts need to be reconstructed or reconstituted page by page—a very time-consuming proposition; the topical range of the writings calling for multi- and interdisciplinary expertise; and the lack of high-definition images of the documents, which impacts transcription procedures and cost. Other factors include the ever-increasing expectations that accompany the continued acceleration of technological development; the cost of those technologies, with ever-changing hardware, software, programming and coding standards, and design philosophies; the staggering personnel costs of the operation; staff turnover, continuing training, steep learning curve; the time it takes to set up and maintain viable collaborations; and the permanent lack of funding and attendant efforts to raise funds and apply for grants. The idea of a comprehensive chronological edition of the Peirce papers began to be conceived at the beginning of the 1960s. Not that such a wish had not been expressed even earlier—C. I. Lewis, for one, mused about it in the 1930s—but four factors precipitated the need for it. The first stemmed from the publication of the Collected Papers in the first half of the 1930s (the first six volumes) and the last half of the 1950s (volumes 7 and 8). The effect of the Collected Papers was to jumpstart the scholarly study of Peirce’s writings and sustain its vigor for more than forty years. 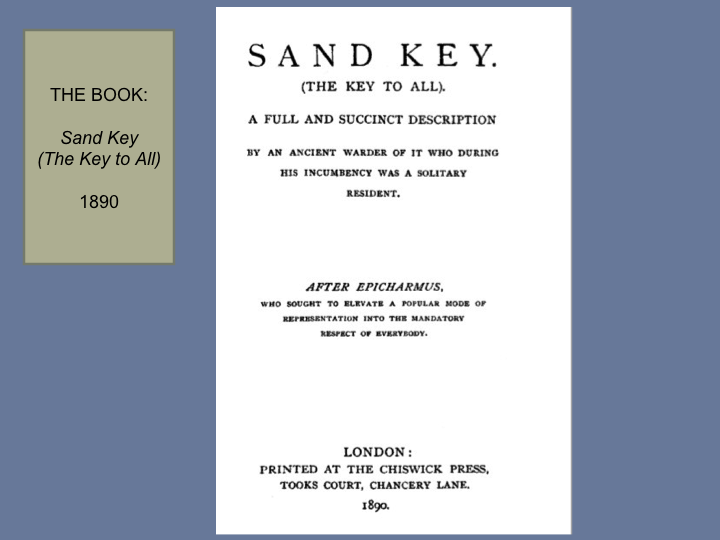 That edition saved Peirce from oblivion and attracted vigorous interest, especially after the end of World War II, when the Peirce Society was founded in 1946 under the combined leadership of Frederic H. Young, Charles Hartshorne, Paul Weiss, and a host of other philosophers. Max Fisch was the third factor. The Philosophy Department of Harvard University appointed him official Peirce biographer in 1959. 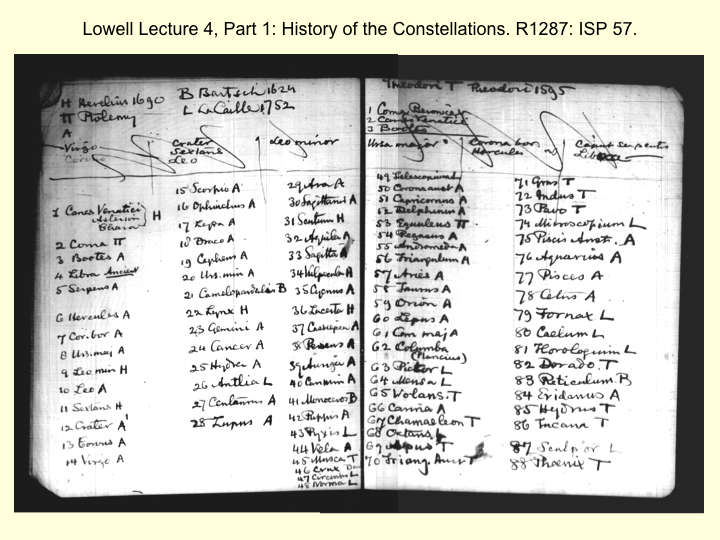 That appointment set Fisch on a lifelong quest for a complete chronological reconstruction of everything pertaining to Peirce’s activities: his personal and professional life, his writings, his correspondence, his travels, his social interests, his scientific endeavors, his health, and his many challenges and struggles. Key to the completion of such a large research program was a better organization of Peirce’s Nachlass at Harvard—the fourth factor. That cataloging effort took place during the first half of the 1960s, and involved Max Fisch, his wife Ruth, Don D. Roberts, John Boler, Carolyn Eisele, and Richard Robin. It culminated with the microfilm edition of the Harvard Peirce papers in 1964, paid for by Fisch’s home institution, the University of Illinois at Urbana-Champaign, and the publication three years later of Robin’s Annotated Catalogue of the Papers of Charles S. Peirce (1967). Robin and Fisch agreed that organizing the papers topically, using Peirce’s classification of the sciences as a leading principle, was a necessary compromise: no one had the resources nor the time to sustain the formidable task of dating the manuscripts. That fundamental task would have to be conducted incrementally over ensuing decades. At the beginning of the 1970s a cluster of Peirce scholars at Texas Tech University, Lubbock, founded what is now the oldest Peirce research center in existence, the Institute for Studies in Pragmaticism. They were Charles Hardwick, Kenneth L. Ketner, and Joseph Ransdell—and also Max Fisch who, after his retirement from Illinois, was brought there as a Visiting Professor. That group began making plans for a comprehensive chronological edition. 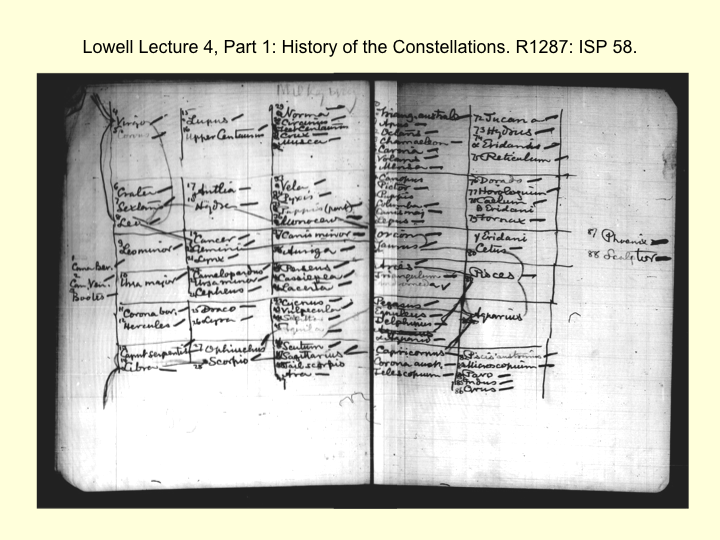 They converted the microfilm into an electroprint paper copy, spent a summer at Harvard comparing it with the originals and completing the set, recorded descriptions of the physical attributes of the documents, and stamped each sheet of the copy with unique identifying numbers. One issue to be solved was identifying a university institution willing to host this initiative. The answer came from Indianapolis, where another Peirce scholar, who had been the founding editor of the Transactions of the Charles S. Peirce Society (1965), held a high-ranking administrative position at the recently created campus of Indiana University-Purdue University Indianapolis (IUPUI). As Executive Vice Chancellor and Dean of the Faculties in a young entrepreneurial institution open to multiple initiatives, Edward C. Moore took it upon himself to establish the Peirce Edition Project at IUPUI. Fisch agreed to become the general editor of the operation and moved to Indianapolis in 1975. Moore became the first Project director. Christian Kloesel, who had been teaching in the English department also at Texas Tech University, was brought in as well as assistant editor. An advisory board was established, and a textual editor was hired away from the Dewey Center (Lynn Ziegler). Grants were applied for. And so it was that, supported by Indiana University and with grants from the National Endowment for the Humanities (NEH) and the National Science Foundation (NSF), the Peirce Edition Project began operation in July 1976 in Indianapolis. A staff was hired and a concerted effort was made to locate all of Peirce’s publications and manuscripts. The arduous process of rearranging and dating the nearly 80,000 pages copied from the Harvard Peirce Papers was begun, using two sets of photocopies of the original electroprint made in Lubbock. During the first three years the organization for a complex critical edition was put into place: policy and editorial guides were drafted; contributing editors were chosen (some specialized in the early writings); editorial and advisory boards were appointed; a publishing contract was negotiated with the Indiana University Press; dues were paid for the rights to use materials published in the Collected Papers; and work was begun on the first volume. It took six years to publish the inaugural volume (1982), much longer than originally thought. That was due to the fact that none of the founders of the edition could have initially fully grasped the formidable scope and difficulty of the task at hand (see section 4 under the Mission submenu). It had been one thing for Hartshorne and Weiss to publish the six volumes of the Collected Papers in ten years’ time (1926-1935)—in itself an incredible accomplishment worthy of permanent appreciative amazement. But it turned out to be a completely different thing to churn out a scholarly critical and chronological edition, an ambitious mission exponentially more demanding and complex given the staggering amount of research it necessitated, document by document, in order to do justice to a seminal mind of the first order, serve posterity, and meet the high standards of the Committee on Scholarly Editions of the Modern Language Association. How to apply those standards and adapt them to the vast broken mosaic of Peirce’s surviving texts became a permanent issue subject to unending, ever-evolving investigation, challenged afresh by nearly every new manuscript—for nearly every Peirce document comes with unprecedented textual cruxes. It took some years before Peirce Project leaders realized how much the edition was going to be, inescapably, a long-term proposition. A branch of the Project, led by Don D. Roberts, a former student of Max Fisch, opened at the University of Waterloo and operated there until the mid-1980s. (The archival records from the Waterloo operation were returned to Indianapolis in 1998.) One principal charge assigned to the Waterloo satellite was the preparation of volume 4. Roberts hired assistants to help him in this task, one of whom was to become a key player in Peirce Project history, Nathan Houser. Ed Moore retired from IUPUI in 1983, not long after convincing Houser and his wife Aleta to move to Indianapolis and join the staff. Christian Kloesel took the helm as director and editor, and the Project was integrated within the School of Liberal Arts, in whose building it had been moved to the top floor. Volume 2 appeared in 1984, and volume 3 in 1986. A young doctoral student from Belgium had by then just arrived, in late 1985, to begin research on his dissertation. Fisch, Kloesel, and Houser took him under their wings and began instilling in him the rudiments of every aspect of their profession. In 1988, the original textual editor, Lynn Ziegler, left the Project after having laid solid methodological foundations to sustain the rigorous critical editing workflow of the operation. Finding a suitable replacement proved difficult because the position required highly specialized skills rarely taught anywhere. A period of disruption ensued with various ups and downs. The ups included the publication of volume 4 (1989) and volume 5 (1993) of the Writings, of the first volume of The Essential Peirce by Houser and Kloesel (1992), the hiring of the young Ph.D. from Belgium as assistant editor (1992), and the hiring of textual editor Jon Eller, who proved to be a model of competence (1993). The downs included Max Fisch’s ultimate retirement (1991), and NEH declining funding in 1993. Steps were taken to absorb an inevitable budget slashing, including drastic personnel reduction. Soon thereafter Kloesel resigned to make way for a sweeping reorganization and Nathan Houser was appointed as the Project’s third director, with the title of general editor. Houser instituted a number of substantial changes. Production methods were revamped and the workspace redesigned for greater efficiency. In 1997 NEH awarded the Peirce Edition a new grant which, along with additional funding from IUPUI, enabled Houser to reestablish a full production team and to reorganize the advisory board. Houser hired Kees de Waal as assistant editor and Albert Lewis as associate editor in 1998, the same year that saw the publication of volume 2 of The Essential Peirce. Lewis began instituting new technological methods of production made necessary by the adoption of the guidelines issued by the Text Encoding Initiative Consortium. That adoption ushered in the era of SGML mark-up encoding and the steep learning curve it entailed along with a rethinking of the entire workflow. 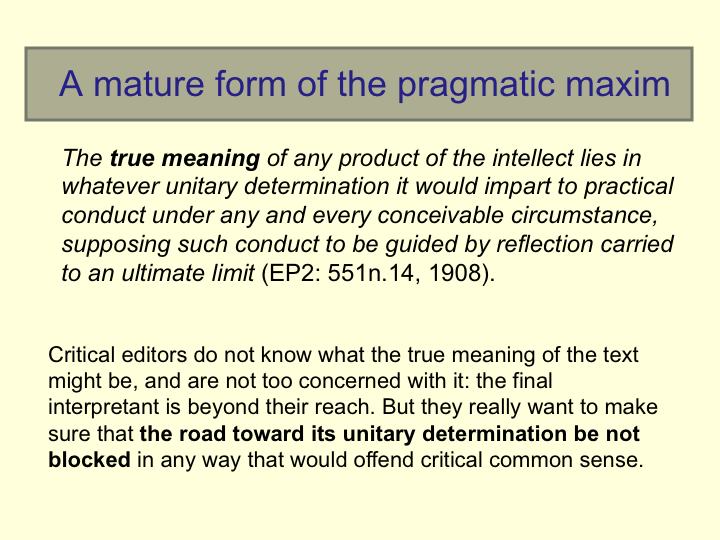 Volume 6 appeared in 2000 and reflected numerous design changes, the result of evolving editorial policies more and more influenced by the logical application of Peirce’s pragmatic maxim. 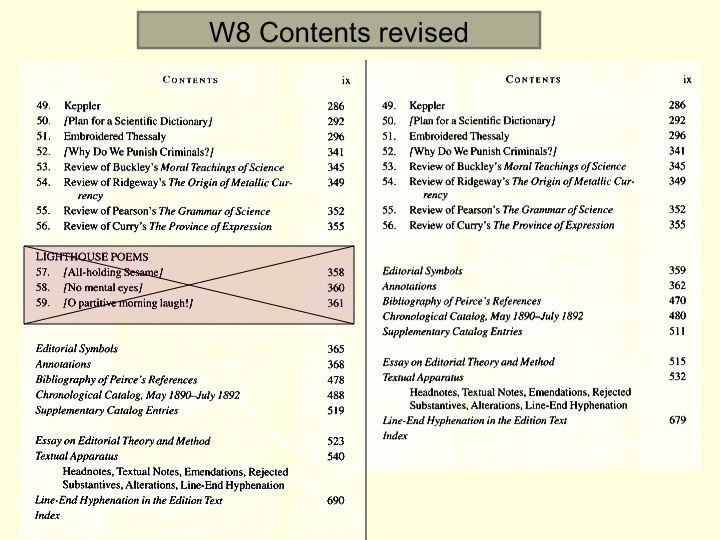 Volume 6 contained in particular a document that had never been published before, Peirce’s formidable but ill-fated “Report on Gravity,” which was and remains by far the most complicated case of copy-text in Peirce Project history. The following decade, the first one of the twenty-first century, became a long lesson in hard academic realism. It began auspiciously, with the Project seeking to establish new satellite operations abroad in order to help speed up production. An agreement was struck in 2001 with Professor François Latraverse, director of the Peirce-Wittgenstein Research Group at the Université du Québec à Montréal. He and his institution agreed to take charge of the production of volume 7 of the edition, a volume entirely devoted to Peirce’s 1883-1905 contributions to the Century Dictionary and Cyclopedia. Volume 7 stands to be one of the most complex volumes in our series, so complex that any time estimate made for its completion turned out to be a doomed miscalculation. The work done in Montreal on that volume has been extraordinary, including prodigious technological advances that are inspiring our current technological efforts in Indianapolis. 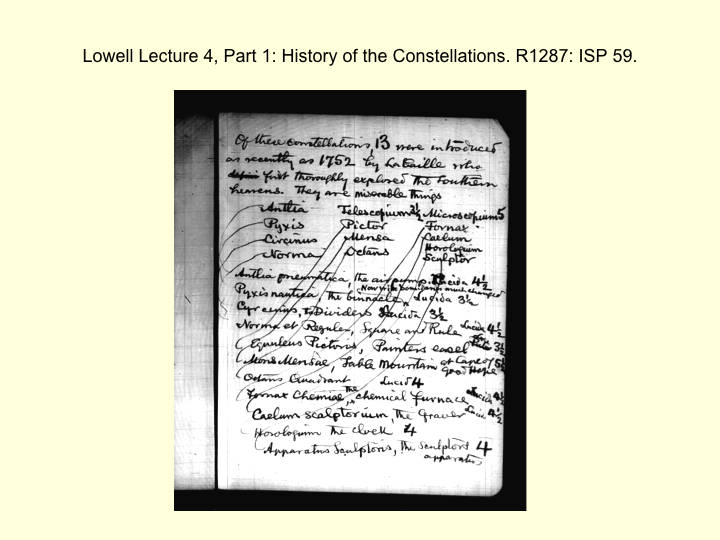 Another collaboration that began at about the same time involved Professor Helmut Pape in Germany, a collaboration that focuses on the production of volume 22, containing the Lowell Lectures of 1903 (together with the Syllabus). Planning and implementing collaborations are necessary gambles. There is never any telling how far or how long they will be successful, but they are always worth the time investment, invariably considerable. While all this was going on, the School of Liberal Arts had kept expanding steadily from year to year, welcoming a number of new research centers in many departments, including other scholarly editions: the Santayana Edition, and the Frederick Douglass Papers. This meant that School resources began to thin out, with funding diminishing for individual centers, putting greater and greater strain on existing staff. Another source of strain was space: editions quickly accumulate not only large archives, but also additional scholarly resources, often donated by retired or deceased scholars. The Peirce Project library was bursting at the seams, all rooms tightly packed with file cabinets and boxes. For the sake of efficiency, savings, and other strategic considerations, decision was made to consolidate the three editions under one umbrella, the Institute for American Thought (IAT), and to move them out of the School’s main building into the much larger basement of the School of Education. The move took place in late 2004 and caused immense disruption: everything had to be reconfigured, reassembled, redistributed, and sometimes reconstructed or built anew. Houser became the IAT’s first director, with Eller as associate director. Eller in the meanwhile had begun to give birth to a fourth scholarly center, which opened in the spring of 2007 as the Center for Ray Bradbury Studies (Eller is one of the world’s foremost specialists of Bradbury). The fast expansion of the IAT entailed the direct consequence that Peirce Project principals were more and more diverted, owing to their institutional experience, to broader ventures, all meant to strengthen the Institute as a core humanities research center of the School of Liberal Arts. This, however, began inevitably to impact productivity within the Project. And indeed, no one could have predicted that in the end it would take ten years to publish volume 8 (2010). Houser retired in 2008, as well as Associate Editor Lewis. Eller had become interim director of the Institute, and was later succeeded by Professor David Pfeifer, one of whose initiatives was to bring in a fifth edition to the Institute, the Writings of Josiah Royce (that edition is administered by the IAT but the work is done by outside scholars). In 2013 Pfeifer was succeeded by Professor Marianne Wokeck, former director of the Santayana Edition. André De Tienne (the scholar from Belgium) became the Project’s director and general editor in July 2008. His first task was to bring volume 8 to completion while focusing also on the production of volume 9 (1892-93) and volume 11 (Peirce’s projected 1894 book on “How to Reason: A Critick of Arguments”). In 2011 Associate Editor De Waal left the Project to become the editor-in-chief of the Transactions of the Charles S. Peirce Society. The impact of personnel retirement or departure took a toll, especially as the School of Liberal Arts entered a period of decreasing enrollment, with the consequence that none of the positions left vacant could be filled. This impacted production of volume 9, which is slated for completion later in 2015.
enable designers to layout the texts and companion textual apparatus for a print volume, or to ready them for a digital edition. Development of this platform, called STEP for Scholarly Text-Editing Platform, is well underway, thanks in part to funding received from the National Endowment for the Humanities (an implementation grant that would enable us to finish STEP has been applied for). See the Technology tab for more information. institute a quality-assessment system that keeps track of contributors, gauges the quality of their contributions, protects the system’s integrity to guarantee a safe and productive scholarly environment, and offers peer-reviewed certifications scholars can use as evidence of their professional worth. A prototype of CORPUS has been designed with the assistance of the Human-Computer Interaction program of the School of Informatics. See again the Technology tab for more information. The third part of the solution consists in the creation of an online repository of high-definition digital images of all of Peirce’s manuscripts and letters. Such a repository would be open to all users, and be very useful both within STEP and within CORPUS. Planning for it is actively underway and involves an international consortium. That plan calls for the creation of a generic platform usable by multiple editions (COIMBRE: Collaborative Online Image-Based Research Environment), and for a derivative application called the Digital Peirce Archives (DPA). The fourth part of the solution, which could start as soon as STEP is done, is to begin enlarging the Indianapolis-based Peirce Project to scholars and research centers based in other universities whether in America or in Europe, negotiate workable collaborative agreements, rethink the entire workflow and the distribution of responsibilities on such an enlarged basis, and train scholars in the use of STEP and the application of textual and editorial policies. If that can be accomplished incrementally, the Peirce Edition Project will then be reconfigured into an Indianapolis-based hub with spokes extending to other institutional bases wherever these may be found. Volume production and print or digital publication will therefore be accelerated, making it possible for CORPUS to become alive and become an active, interactive, collaborative, ever-growing repository of Peirce’s writings with dynamic connections to the products of scholarship. Scholars who are interested in joining this effort are invited to contact the Project director to begin a conversation. De Tienne administers the Project, writes grant proposals, raises funds, establishes work plans, oversees inter-university and international collaborations, and maintains contact with I.U. Press. He coordinates the reorganization and dating of manuscripts, finalizes the tables of contents, writes volume introductions, and prepares the volume by volume catalogues of Peirce’s writings. He is in charge of the annotations (historical, explanatory, and bibliographical) for the volumes and of the bibliographical research. He is also responsible for the description and selection of alterations to be published in each volume, and for the preparation of the index. He also helps develop the new technologies for the production and dissemination of the products of the edition. Eller’s principal duties are with the Center for Ray Bradbury Studies, which he directs. His work for the Project includes helping trace text genealogies, supervise collations, select copy-texts, edit Peirce texts according to guidelines deriving from standard textual theory, and co-author the essay on editorial method for each volume. The textual editor is the principal interpreter of modern textual theory for Project operations. He is also the Senior Textual Editor of the Institute for American Thought. 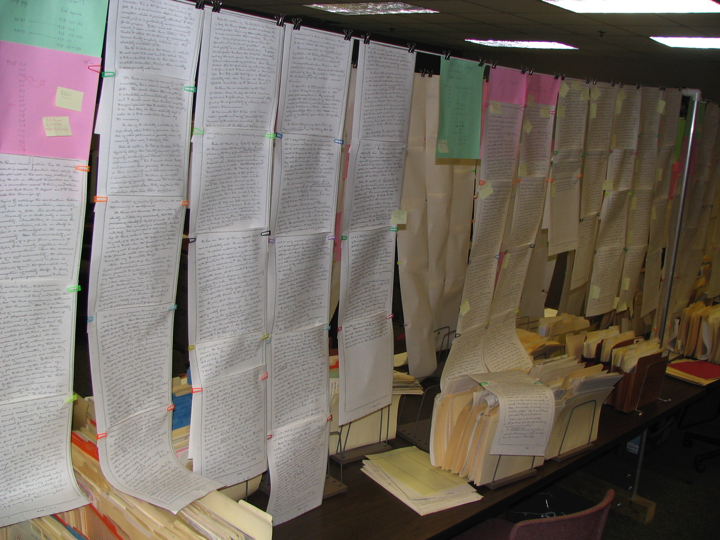 Witt’s responsibilities include collating texts, selecting copy-texts, editing Peirce texts, writing headnotes and textual notes, and keeping the record of editorial interventions. She keeps the Project’s “Editorial Guide” up to date by recording new policies or modifying old ones according to the evolution of editorial practices in the face of changing textual situations. She is also in charge of illustrations, and acts as Project manager supervising the Project workflow, including the graduate research assistants’ annotation work. O’Haver is in charge of the transcription operation. He provides accurate transcriptions of Peirce’s writings, team-proofreads transcriptions and coordinates proofreading sessions, conducts archival proofreading, enters corrections and emendations into transcribed text, maintains physical and electronic files, trains proofreading assistants, helps implement new transcription technology, lays out the final critical print edition, and prepares camera-ready copy for the printer. O’Haver is studying toward a graduate certificate in Human-Computer Interaction and an MS in Informatics. As such he helps design and prototype some of the STEP Tools and maintain the Project’s website. Kaposta’s time is divided between the Center for Ray Bradbury Studies and the Peirce Project. He helps transcribe Peirce’s writings, team-proofread transcriptions, and enter proofreaders’ corrections and editorial emendations into transcribed text. Pfeifer is the Director of the Josiah Royce Edition. He assists the Peirce Project in maintaining our archives, producing finding aids, and providing administrative and strategic advice. 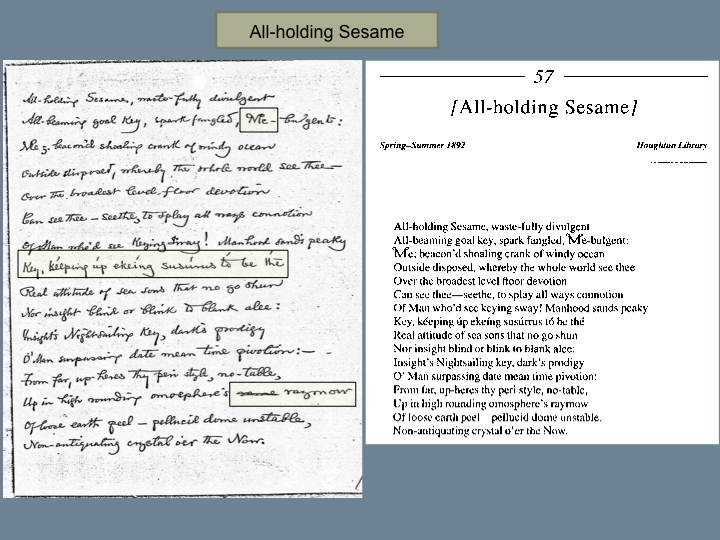 Morton assists in researching and writing annotations for the texts of volumes in progress. Web and database developer Chang is in charge of building and maintaining the websites of IAT units, and assisting the Peirce Project’s development of Drupal-based production and dissemination platforms (STEP and CORPUS). Philosophy graduate students Frank Schwarzkopf and Jimmy Aames research closely the content of Peirce’s texts selected for publication. 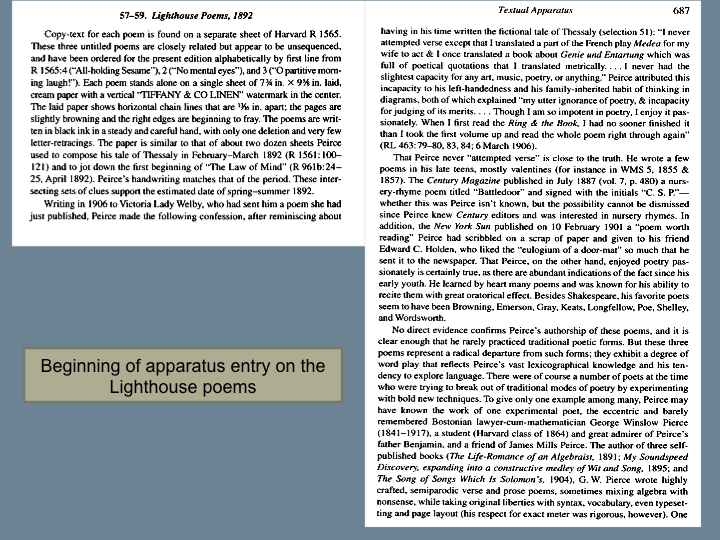 They draft annotations that identify obscure proper names, provide the bibliographical sources of Peirce’s quotations and paraphrases, and furnish cross-references to other relevant primary or secondary sources. They also help revise and maintain the research-related content of the Peirce Project website. Rujuwa serves as office manager for the Project and is in charge of all secretarial functions for PEP. She assists the Director with Project administration and oversees visiting researchers. Liu provides administrative support and assists Rujuwa in fulfilling secretarial functions. The Board of Advisors advises the Dean of Liberal Arts about Project-related administrative and strategic matters and is the main link between the University and the Peirce community. The Board advises the Project Director concerning the edition (especially text selection and production), and assists him with Project development. Board business is conducted via email, telephone conference, or occasional gatherings at professional meetings. The chair of the Board is the main link between the Project Director and the Board membership. All Board members are appointed by the Dean of the School of Liberal Arts for renewable three-year terms. 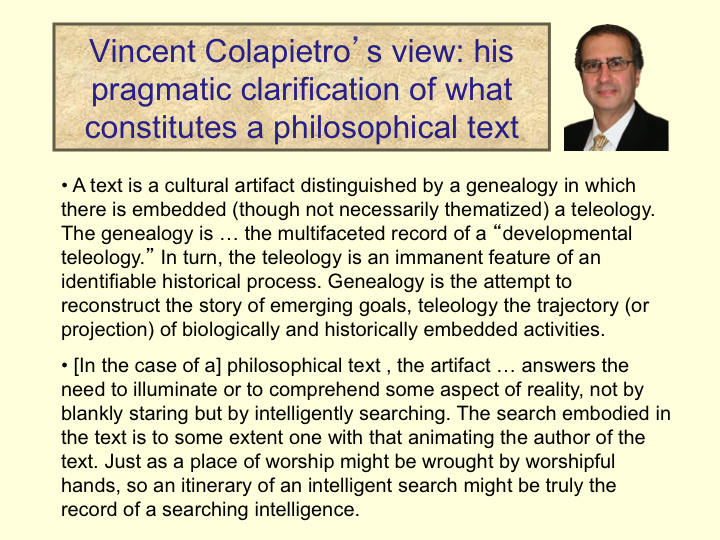 VINCENT COLAPIETRO is Research Professor of Philosophy at Penn State University. He was appointed Chair of the Board of Advisors in March 2009 after having been a member since 1998. His responsibilities include representation, critical advice, support, promotion of the Project, and decisional consultation. As Chair of the Board, Colapietro is the main link between the Board and the Project. He is apprised monthly of staff meetings and Project affairs, and advises the Project in matters relating to edition, administration, and development. 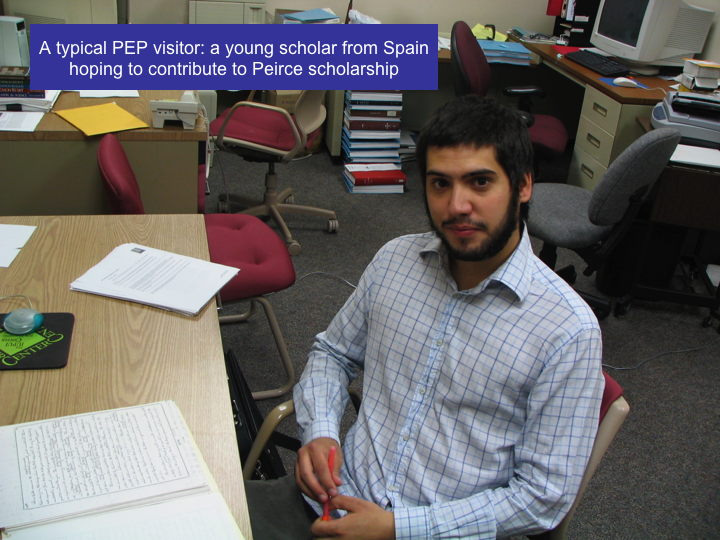 The Peirce Project has been able to provide in average two graduate research assistantships every year, in partnership with the Philosophy Department in the School of Liberal Arts. The Department is generally allocated a variable number of block grants every year, one or two of which are shared with the Peirce Project according to a funding formula that has the Project provide one half of the fall and spring salaries, while the Department provides the other half plus tuition fee remissions and health insurance. The details of that formula may vary according to budget conditions, availability of grants, donations, and financial health. Those positions cover both the fall and spring terms. Summer hourly positions are entirely funded by the Project and are available occasionally. All positions are necessarily part-time, with a strict maximum of twenty hours per week. Students interested in a position should make themselves known to both the Project Director and the Department of Philosophy’s Graduate Director. Final selection is sometimes the result of a negotiation between the Project and the Department. Preference is given to high-performing students unafraid of intellectual challenges and genuinely interested in Peirce. The type of work assigned to research assistants varies according to timing and predilection. One principal task consists in drafting scholarly annotations to the texts selected for publication in our volumes. Students are given the opportunity to hone their research and scholarly skills by conducting minute examination of the texts, with an eye for anything that may need identification or clarification. This includes the following investigative activities. Identifying persons whose names—often just a last name—appear in the text, and writing succinct notes about them when they are not well known—notes that focus on their relevance within the context in which Peirce refers to them. Identifying place names, especially when ancient and no longer well known. 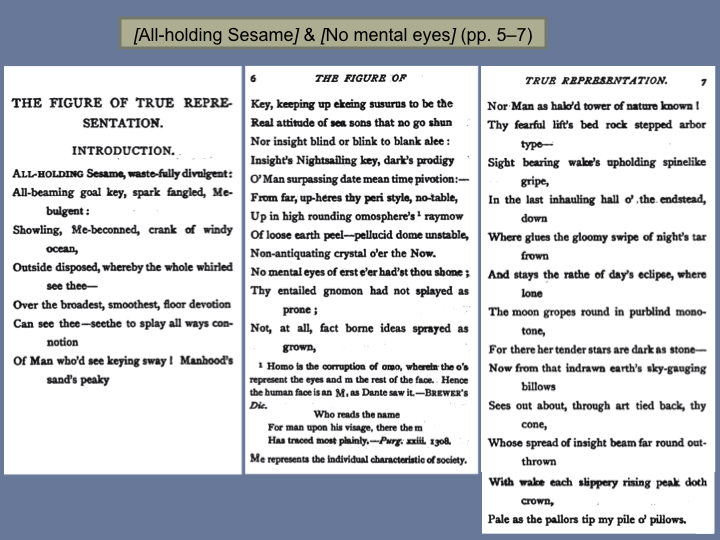 Finding the exact source of every quotation, paraphrase, poetic phrase, adage, or similar literary or philosophical allusion is another activity, which demands that the student locates and obtains a copy of the very edition Peirce most plausibly had in his hands, or if not, one closest to that edition. The “Bibliography of Peirce’s References” that follows the Annotations section in the backmatter of our volumes compiles and consolidates all of those sources in a convenient alphabetical list that also indicates whether the source in question was known to have been part of Peirce’s own library, or whether it is one he checked out from or consulted in a library. All of Peirce’s quotations are checked against the original for exactitude. 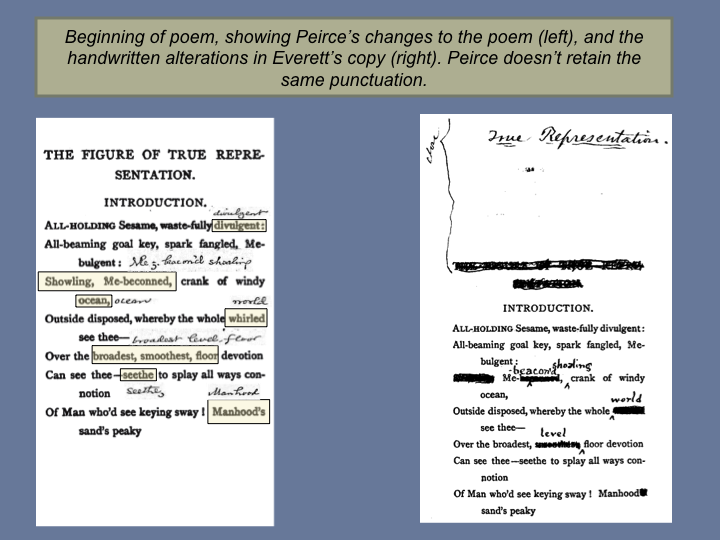 Wherever Peirce’s quotation differs from the original, the textual editor examines the differences and assess whether they need to be corrected through emendation or left alone, the matter being addressed in a textual note. Providing historical background when allusions are made to past events, or contemporary to Peirce. Explaining philosophical, mathematical, and scientific terms, especially when they are no longer in use, or no longer used in the sense Peirce used them. 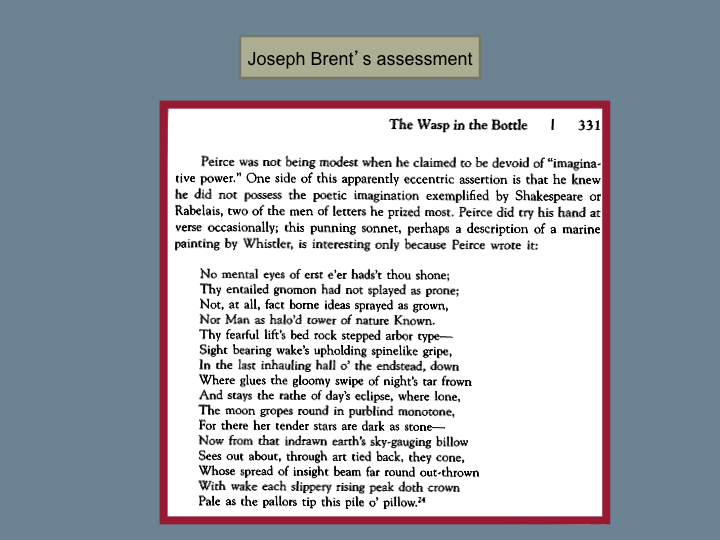 Providing cross-references between particular passages and other prior or subsequent texts where Peirce discussed the same or a directly related topic. 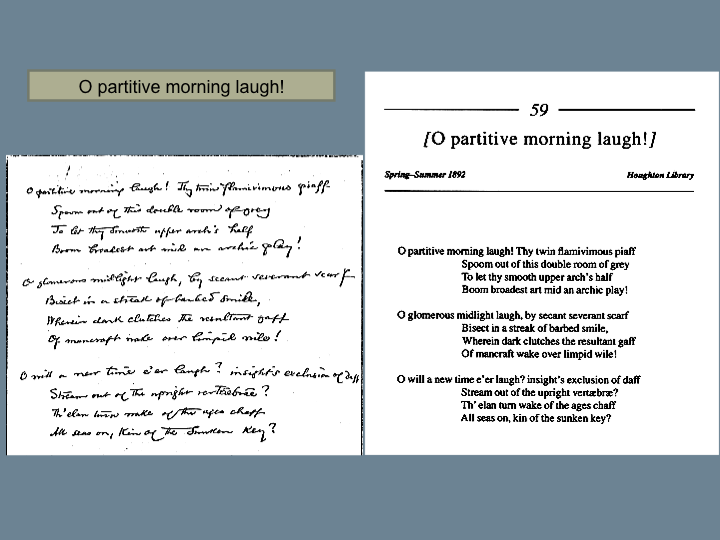 Providing the transcription of alternate discussions coming from variant texts not selected for publication, including sometimes marginal notes Peirce may have made in offprints, when their content usefully complements or supplements particular passages. 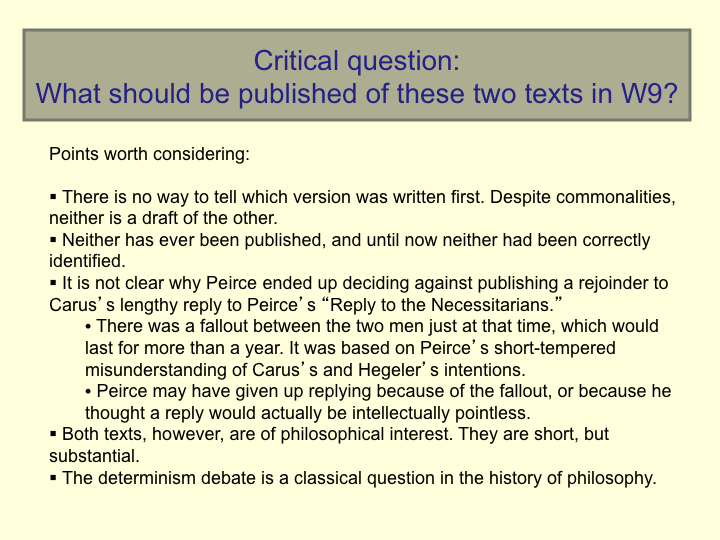 Providing relevant quotations from Peirce’s correspondence that directly address some comment made in the texts, including post-publication comments or evaluations. Checking whether the subject-matter of any proposed annotation has not already been covered in a prior annotation in some previous volume of the Writings, using the multivolume consolidated set of annotations we have compiled for that purpose. Another task assigned to research assistants consists in helping index the Peirce text using LiveIndexer (see Technology tab). 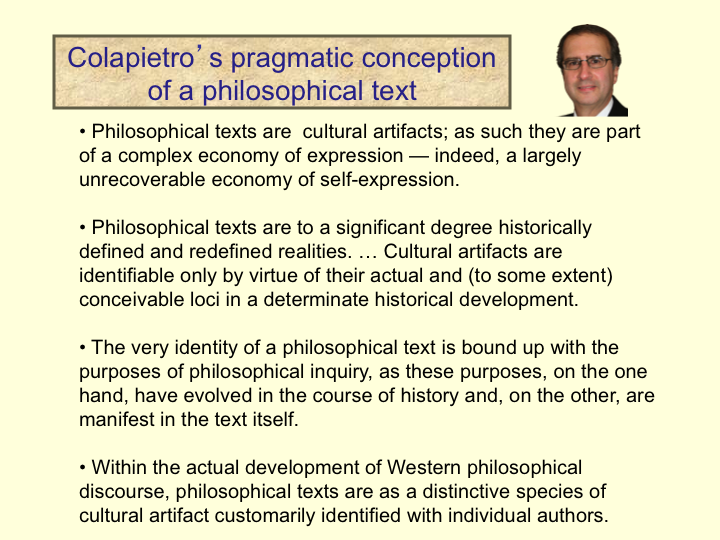 Indexing a philosophical text is one of the most effective kinds of “training in reasoning” one can imagine. It requires such deep scrutiny and extreme attention to textual details, and such exacting skills of reading comprehension, concise expression, and sustained logical and syntactical consistency, that students who successfully deploy such talents over weeks and months of assiduous concentration emerge with sharper analytical and text-interpreting abilities. When a particular index is done, integrating it into the multivolume index is also a task that can be assigned to interns. Testing software being developed by the technological team. Maintaining certain components of the Project’s new website, including continuous research to update representations about Peirce’s significance and relevance. Culling new pithy quotations to extend the database that feeds “Peirce’s pith” on the website. Helping answer occasional questions from our scholarly constituency regarding matters of textual detail in the Peirce manuscripts. 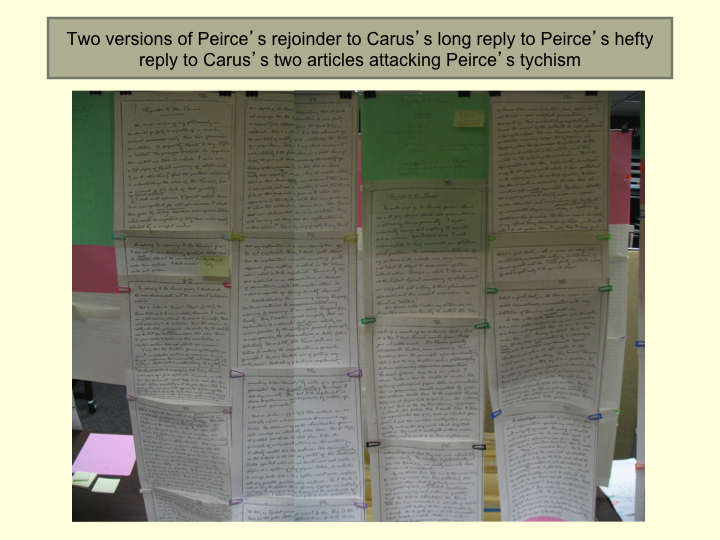 Proofreading transcriptions of the Peirce text or other components of our volumes or of our website. Giving a hand for punctual practical tasks, as occasion arises. It is with great pleasure that we acknowledge the contributions of a long line of research assistants (who are also recognized in the acknowledgments section of our volumes), graduate or undergraduate students for the most part. Listed below in alphabetical order are those who worked on one of the last three volumes, directly or indirectly. Information on PEP collaborations coming soon. More than 80,000 manuscript pages make up the Harvard Peirce Papers, a collection which includes the vast majority of publishable materials in the Peirce canon. 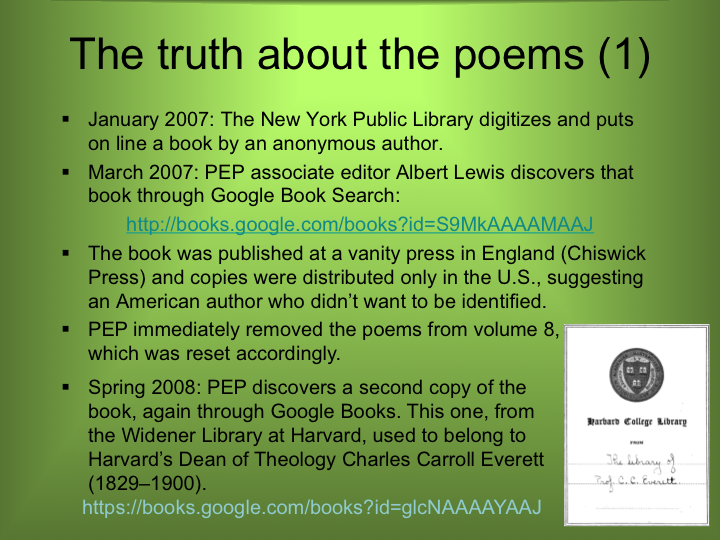 Most of these writings were never published, nor even completed to a fair copy stage; thus, the "manuscripts" at Harvard are often only loose groupings of related pages, and--with few exceptions--no longer represent Peirce’s original units of composition. Extensive searches in the National Archives and the archives of the National Oceanic and Atmospheric Administration have yielded 8,000 pages related to Peirce’s 30-year career in the U.S. Coast and Geodetic Survey, including important letters correcting and even augmenting his scientific publications. Several thousand more pages survive at Southern Illinois University and in other collections across the country. If all of Peirce’s writings were to be published, they would fill over 100 volumes. By electing not to publish multiple variant forms, unless significantly different, nor disconnected fragments, unreduced scientific data sheets, and mathematical and logical scratch pages, the final selection base becomes manageable. In practice, Peirce’s materials from this selection base fall into three categories. Certain documents will be immediately identified for inclusion, because they represent Peirce’s most acclaimed work, and others will definitely be excluded, because they are too preliminary or incomplete. The remaining items are sent to contributing editors, who are asked to recommend if a given item should be published, could be published but is of lesser importance, or should probably not be published. The recommendations of contributing editors provide the basis for the conclusion of the selection process. The final selection is made by the editors, in consultation with members of the Board of Advisors for difficult cases. 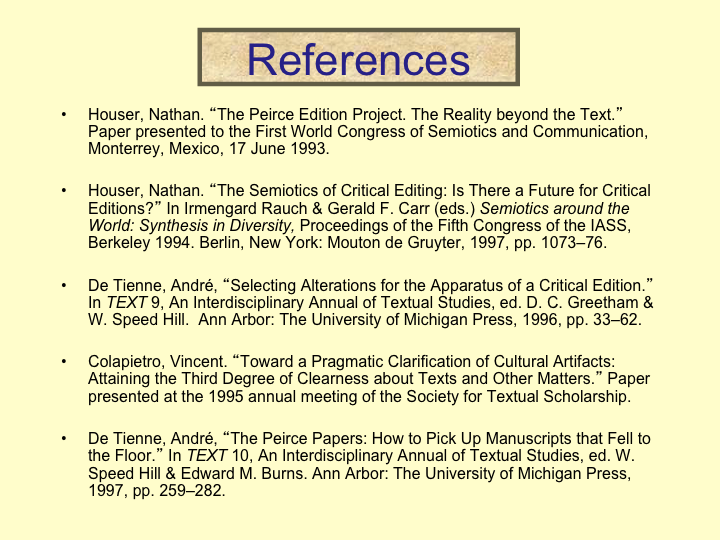 Our central goal is to provide critically edited and reliable texts of Peirce’s work across the wide range of disciplines to which he contributed. 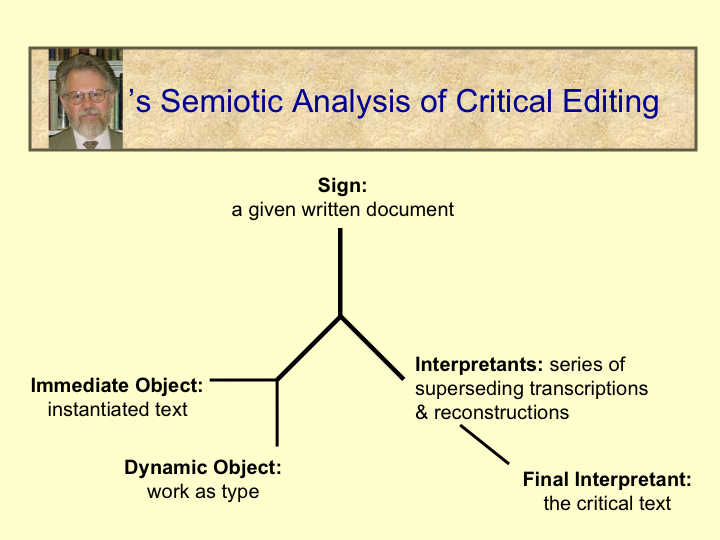 Rather than reproducing a single surviving form of a document, we (as critical editors) identify the most mature coherent form closest to Peirce’s composing hand, and, by incorporating identifiable authorial revisions and corrections from subsequent forms or representations, produce an eclectic text which aims to represent his most fully developed intention. 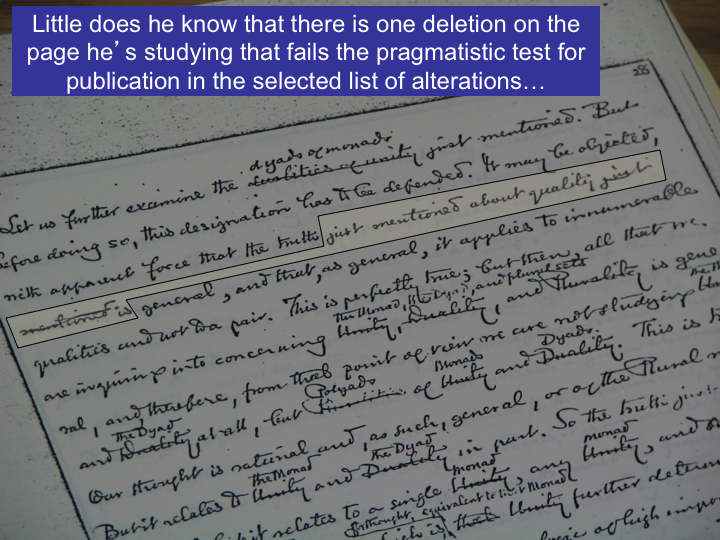 Variants from subsequent published forms of the text judged to be editorial sophistications and compositorial errors are rejected; Peirce’s own errors of content are corrected. This new text, when combined with an apparatus documenting the evolution of the various forms of the work, listing the historical variants, and identifying all of our editorial emendations (and their sources), constitutes the "critical edition" of Peirce’s work. We apply the editorial standards and guidelines of the Modern Language Association's Committee on Scholarly Editions, and have received the CSE's emblem, "An Approved Edition," for all our volumes. 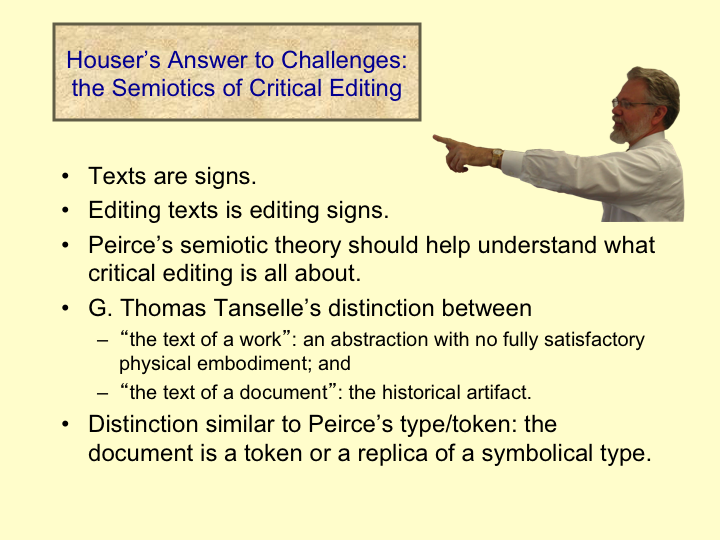 The CSE does not dictate a step-by-step procedure for critical editing, but rather identifies the essential elements (a textual essay, a textual apparatus, and a proofreading plan) and recommends the inclusion of a general introduction providing either an interpretive or historical frame for each volume. 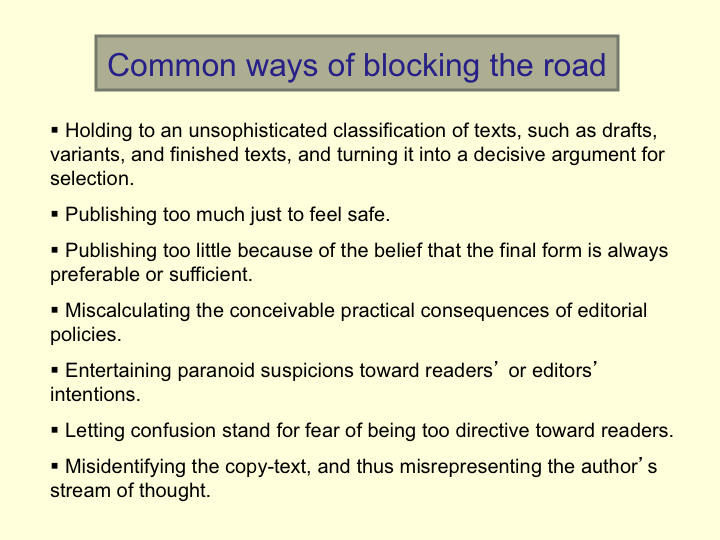 Beyond these elements, CSE stipulates that the editing theory and procedures be appropriate for the particular author. Implicit in the statement of standards put forward in "Aims and Services of the Committee on Scholarly Editions" (January 1992 printing) is a system of evaluation based on three expected outcomes: accuracy, consistency, and clarity of editorial discussion. 1. We are committed to producing a critical, unmodernized edition of Peirce’s published and unpublished work. This edition is critical because our central goal is to produce a text that recovers Peirce’s intentions as an author. 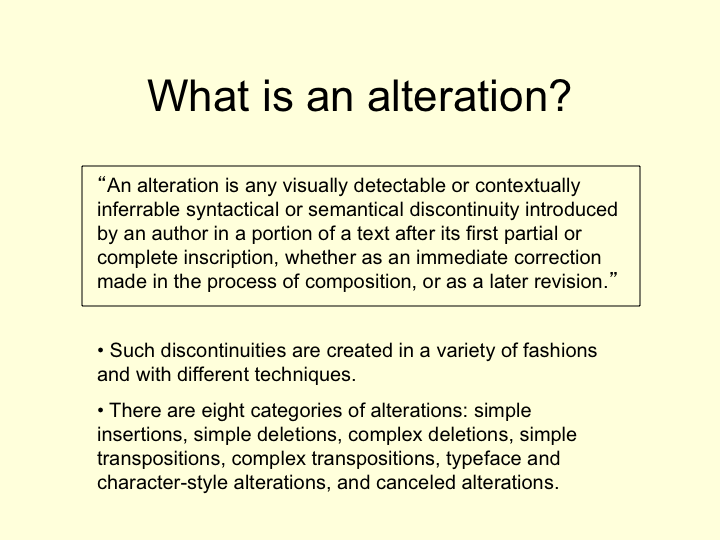 It is unmodernized because, rather than update its accidentals for the benefit of the modern reader, our goal is to present a text that retains the author's preferences in punctuation, spelling, and capitalization. 2. Although we work from master sets of microfilm, microfiche, and photographic copies of Peirce’s papers, we are committed to proofreading our transcriptions against the original documents to verify the accuracy of the transcribed readings, to ascertain the physical characteristics of paper and ink, and to resolve any problematic marks or revisions on the document. This step is part of a comprehensive plan for proofreading at crucial phases in the transcribing, editing, and publishing process. 3. We are committed to determining, as clearly as possible, the transmission of the text and its relationship to other writings in the corpus. 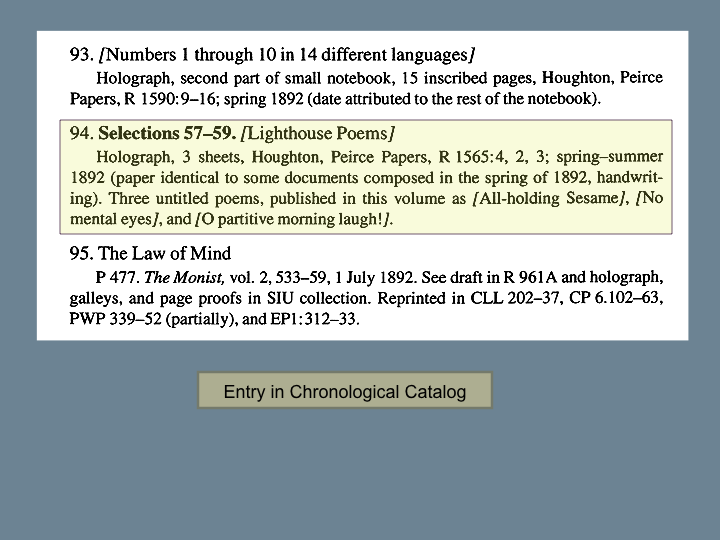 We use standard collation schedules for horizontal comparisons of Peirce’s printed articles with his own corrected and annotated offprints, with errata sheets, and with other copies of the original printing to discover variant readings. Texts transmitted vertically through two or more manuscript, typescript, or copy-set forms are also collated to identify variations. We compare parallel but distant versions of a text to recover the full family tree for a given document. 4. 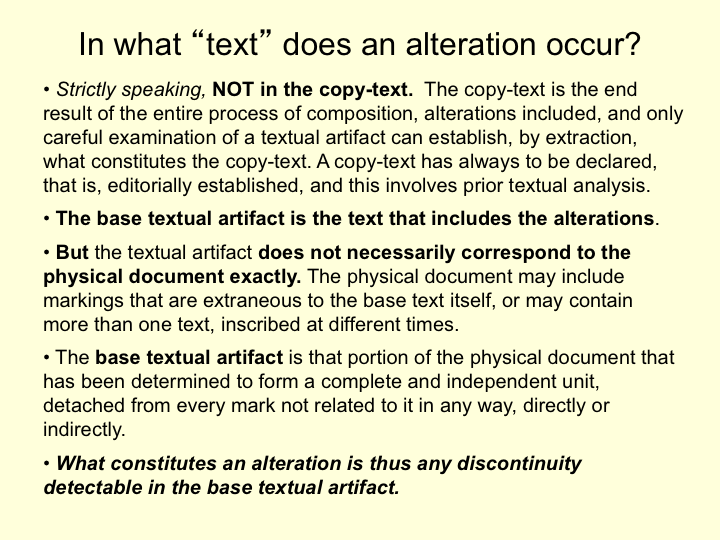 When more than one form of a text exists, we are committed to a consistent procedure for copy-text selection and emendation based on W. W. Greg's "The Rationale of Copy-Text" and modified for nineteenth- and twentieth-century editing situations by Fredson Bowers and G. Thomas Tanselle. (Linked is an updated listing of the copy-text essays we find most useful.) 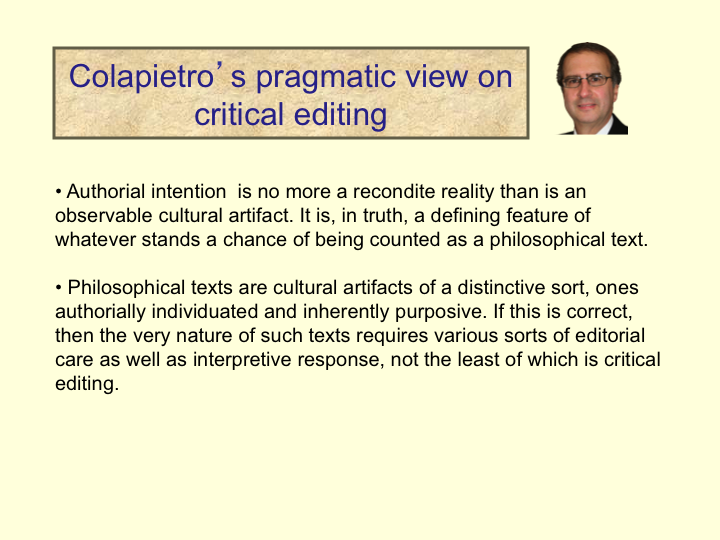 As Greg pointed out, the copy-text concept is not an abstract principle but rather a pragmatic rationale for editing when there exists no compelling evidence for making choices among variant readings from surviving texts. 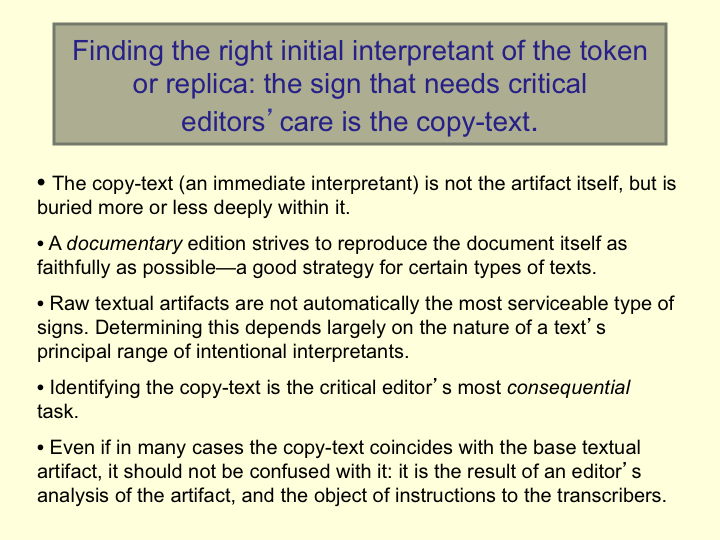 Peirce’s tendency to continuously develop a document in many forms over many years has led us to modify copy-text selection in certain cases where "text" cannot be traditionally defined. 5. In terms of presentation, we are committed to a chronological edition published in a clear reading text. 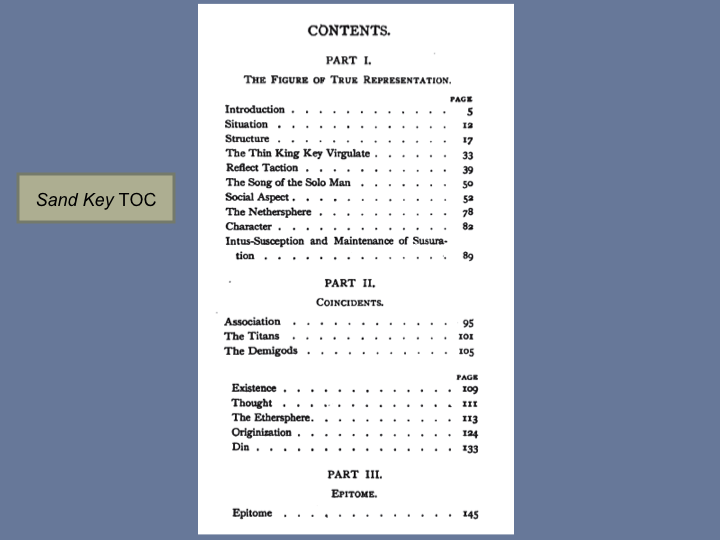 The chronological order of presentation allows us to fit the transmission of individual texts into the larger perspective sought by scholars since Murray Murphey's The Development of Peirce’s Philosophy appeared in 1961; our volumes show the evolving nature of Peirce’s work in each of his many disciplines, the breadth of materials that Peirce worked on (often simultaneously) in particular historical periods, and the emerging patterns of Peirce’s intellectual development throughout his entire lifetime. The clear reading text is made possible by our construction of a textual apparatus keyed to the pages and lines of the clear text. 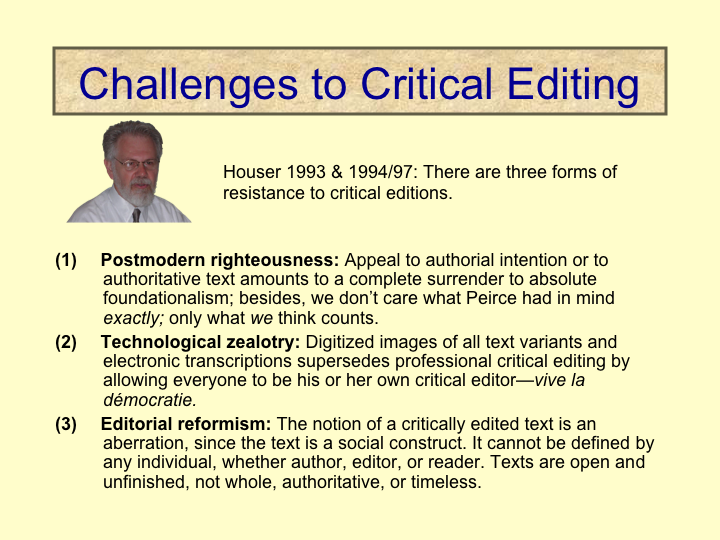 With these general goals in mind, we turn to a discussion of our specific editing policies. (A detailed list of production steps can be found through this link.) Most of our future volumes will each contain from 40 to 80 individual items, diverse in content, and ranging in form from personal journals, notebooks, and lecture notes to published reviews, published articles, and fair-copy drafts of manuscripts intended for publication. This broad range in form requires different editing techniques for the two major categories of materials--papers published by Peirce and his unpublished manuscripts. A number of Peirce’s publications (especially his reviews and his Coast Survey reports) were published more than once during his lifetime. Many of his philosophical publications were heavily revised in offprint for republication, although few ever reached print again. For many of these items, there are a number of surviving manuscript versions and pre-publication proofs. 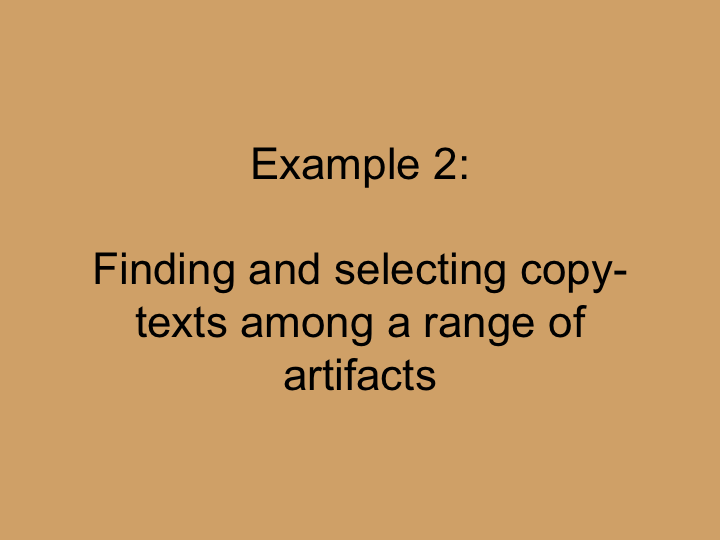 In cases that require a choice among possible copy-texts, a historical collation is used to identify all variants among the relevant forms and to determine the transmission of the text. 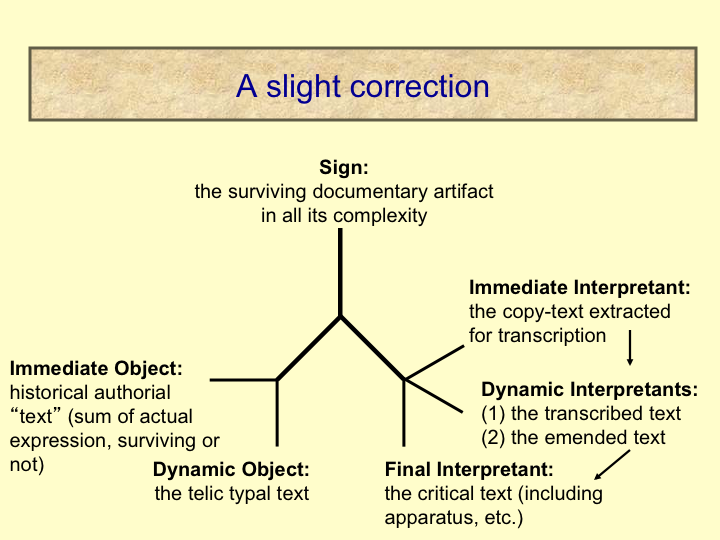 Generally, a manuscript form (or the last draft if a sequence of manuscripts survive), because it represents Peirce’s preference in accidentals (spelling and punctuation) and is the best authority for his word choice, is selected as copy-text. 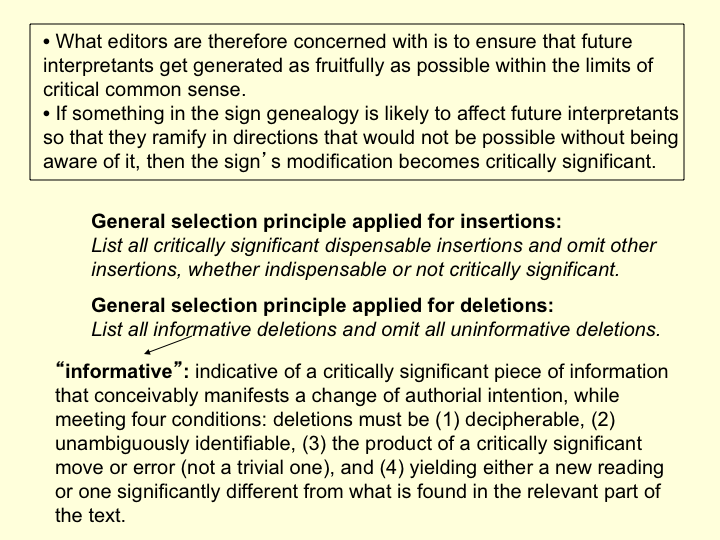 Variants (in the copy-text and in later forms) judged to be the result of non-authorial intervention, such as compositorial errors, compositorial misreadings, or editorial changes in grammar or style, are rejected and noted in the historical collation; non-authorial substantive variants within this category appear in the volume's list of Rejected Substantives. 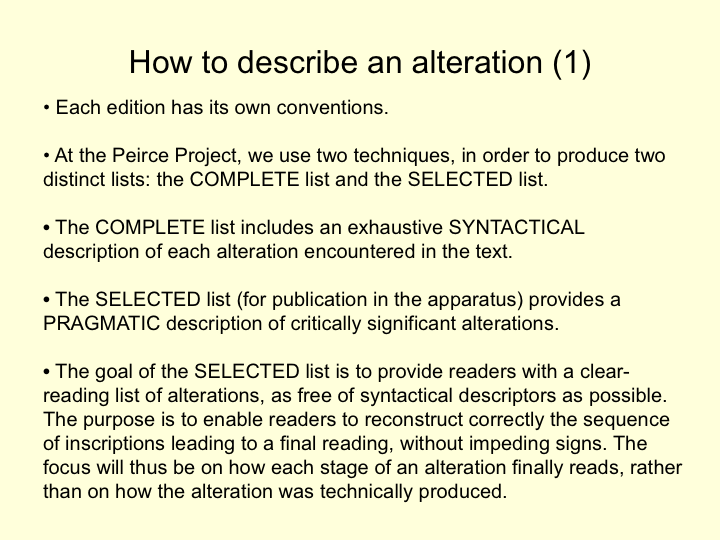 Finally, any revisions by Peirce in the copy-text itself supersede earlier layers of the pre-copy-text; a full record of authorial alterations within the copy-text is made, and substantive alterations within this category appear in the published Alterations List. The complete list of alterations will be included in the electronic version of the Writings. Peirce’s publications appeared in many different journals and periodicals, each with its own house style. We emend title references to conform to our own edition style (Chicago Manual of Style, 14th ed. ); thus we italicize book titles, place chapter titles in quotation marks, and so on. Lengthy quotations set in the text of Peirce’s original publications are offset and indented to conform with our own style for printing extracts. All emendations to the texts are listed, and the sources for each cited in the emendations list. Any changes not listed there are described generically in the Essay on Editorial Method or in the item Headnote in the Apparatus. These include purely visual characteristics, such as the uppercase styling of opening words in a publication, or the scholastic font Peirce tended to use in his own typescripts. When no manuscript survives and the proof or published form must serve as copy-text, we emend printer's styling to conform to Peirce’s own style of punctuation and spelling only if Peirce has demonstrated a clear preference in established practice over time. Peirce’s preference for acceptable nineteenth-century spelling forms, as well as acceptable variant spellings of proper names, are allowed to stand as they appear. For the most part, Peirce shows no clear preferences in such matters as routine punctuation. 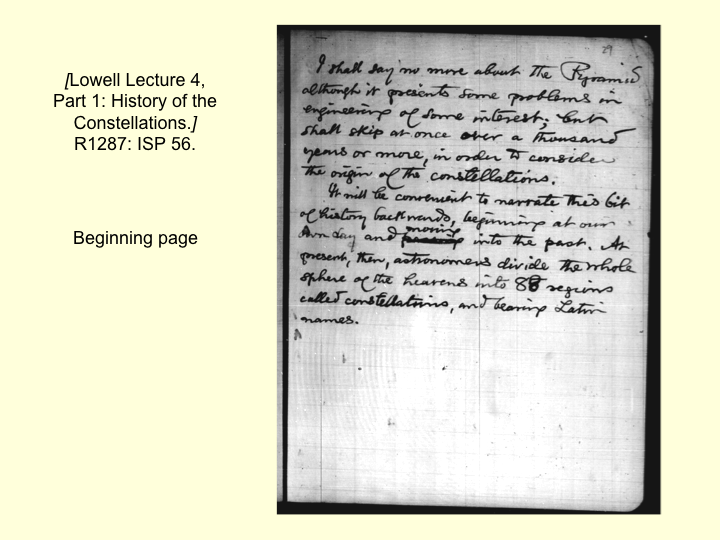 Peirce’s manuscript copy-texts require a different editorial approach than do his publications. With published items where no prepublication forms of the text survive to serve as copy-text, we focus our effort on locating and eliminating editorial or printing corruptions. 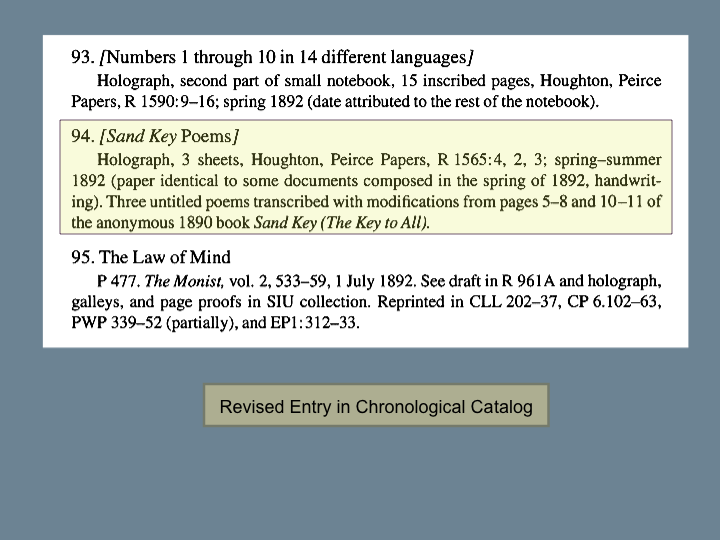 With holograph and typescript items, the focus is on identifying the sequence of Peirce’s revisions--both across drafts and within single drafts that show evidence of one or more layers of revision. 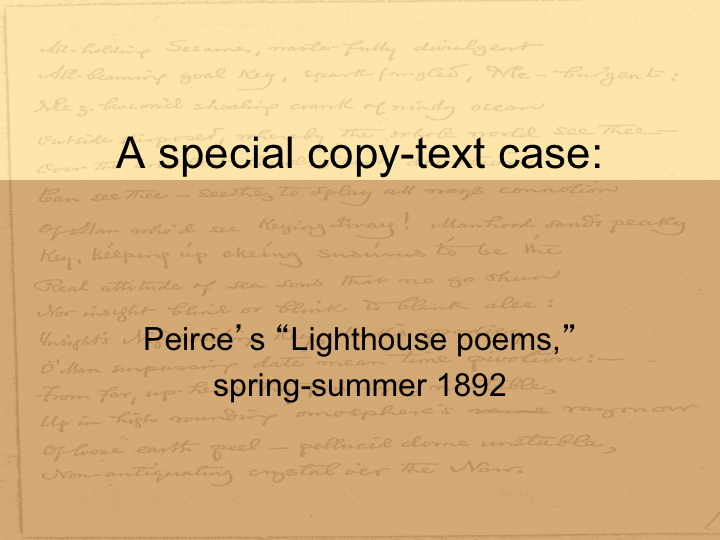 In general, the search for copy-text follows the same rationale used for published items: a mature manuscript form in Peirce’s hand represents the best authority. Where more than one manuscript draft survives, collation will generally lead us to a fairly simple editing decision. 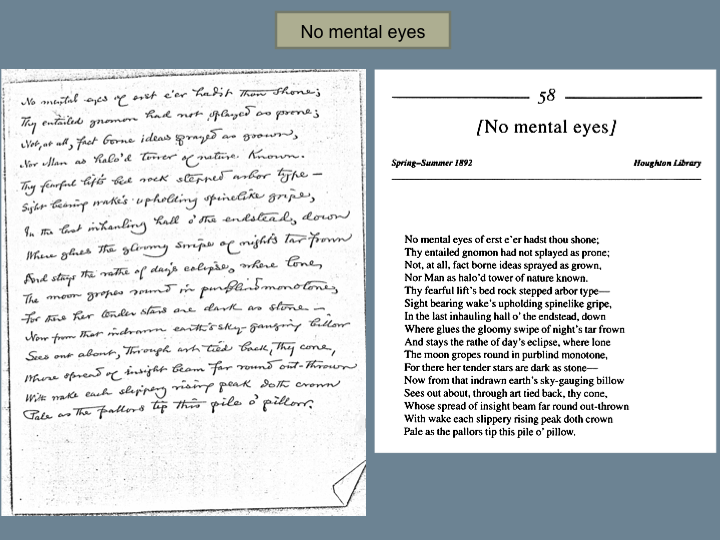 Sometimes, a mature manuscript is followed by a typescript (or an amanuensis draft) prepared under Peirce’s supervision, which contains his holograph corrections and revisions, but varies significantly in both substantives and accidentals from the holograph version. 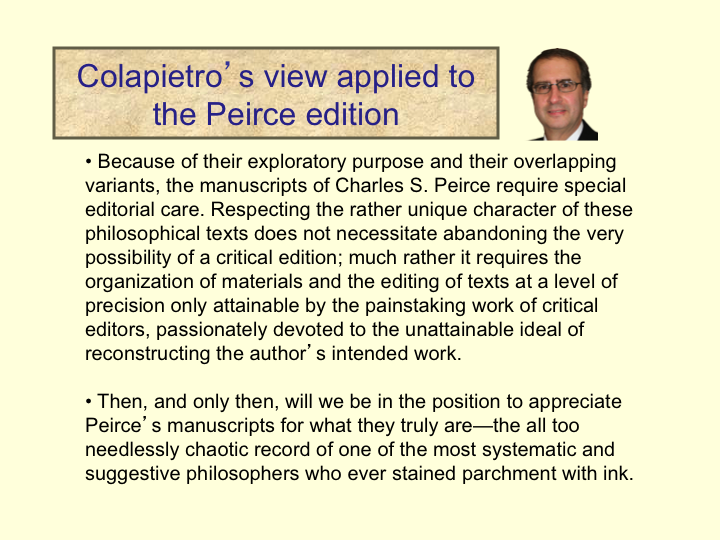 If the two versions are collatable word-for-word, we accept the authority of the manuscript (copy-text) and emend it with those substantive revisions (and corrections to accidentals) that can be attributed to Peirce with a fair degree of confidence. If the typescript is so thoroughly rewritten (which usually indicates a missing intervening draft) that word-by-word collation is not possible, we conclude that Peirce rewrote the document, and use the typescript as copy-text. The surviving earlier stage will be designated a pre-copy-text form and important variant readings will be reproduced or described in editors' notes. 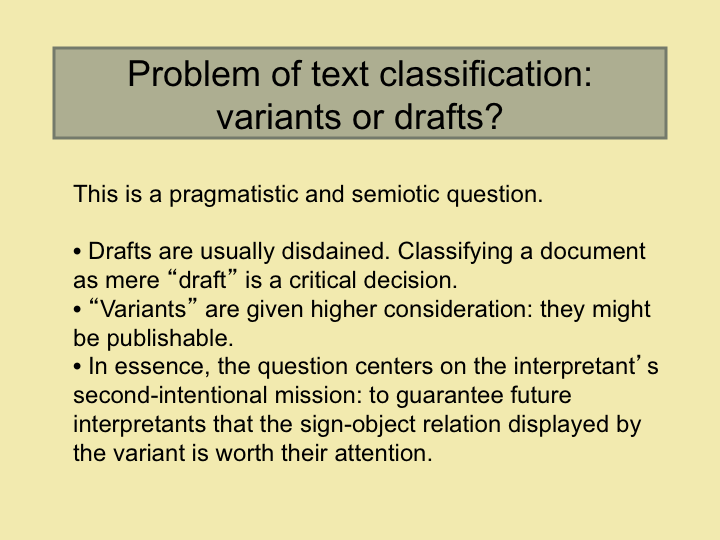 In fact, situations involving widely diverging forms (that derive from single original drafts) represent the most common copy-text dilemma found in the unpublished materials. Successive manuscript versions may repeat the title or have the same or a similar opening sentence, but will often diverge into a related but new line of inquiry or method of argument. Paragraph or outline collation will usually yield a chrono-logical order, but we are left with two or more discrete documents, generally parallel in content but distinct in presentation and development. When parallel versions are equally significant for documenting Peirce’s evolving ideas or scientific findings, we may publish them as discrete items. Each serves as its own copy-text, and will not be emended from subsequent parallel forms; we may refer to other parallel versions for annotation, but not for textual authority. However, as stated above, our decision to publish an electronic edition has reduced the need to publish parallel versions in the print edition. 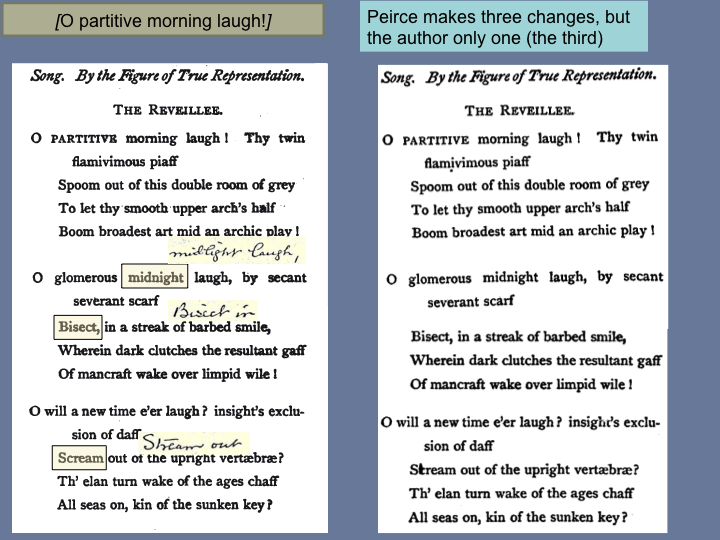 Through W4, our transcriptions consisted of Peirce’s final revised text, and contained no record of the initial readings or layers of revision beneath Peirce’s final alterations. Thus words marked for transposition were automatically transposed, words careted were inserted, but words and punctuation Peirce had deleted were not transcribed. 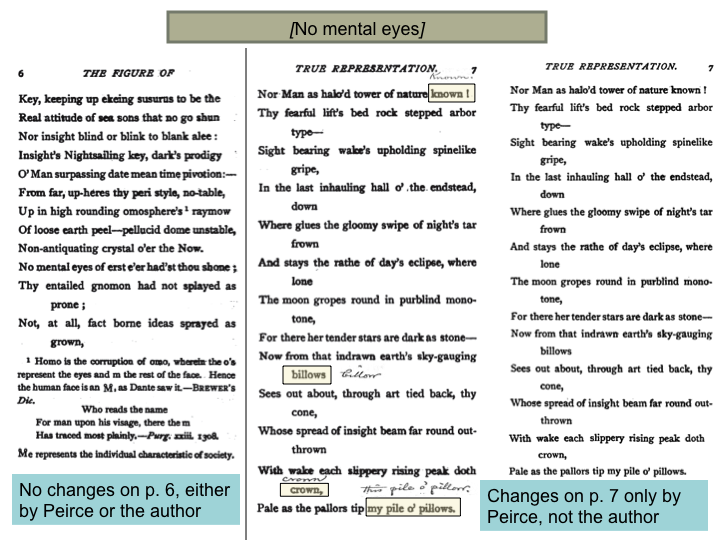 With the recommendation of NEH consultants, and with our present computer capabilities, we now make literal transcriptions of Peirce’s text; that is, we show layer by layer what appears in the original document. 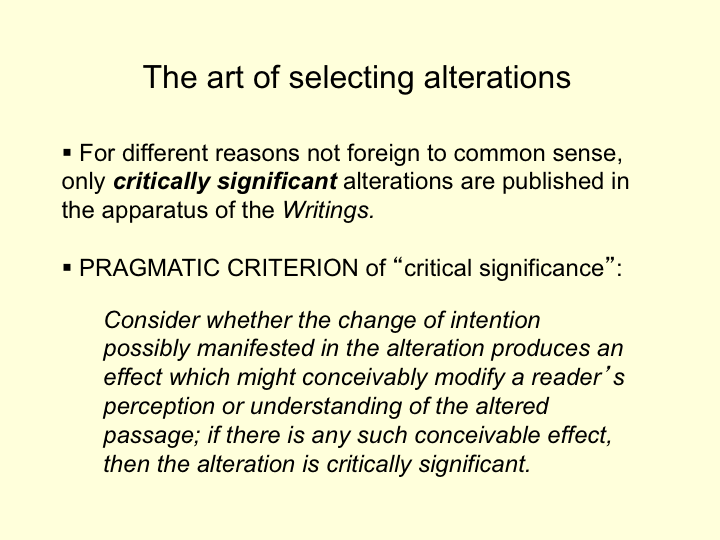 We archive the full record of Peirce’s pre-copy-text alterations, but only those alterations that manifest a "critically significant" change of intention in the process of composition will appear in each volume's apparatus (however, the complete record of alterations will be included in the electronic edition). 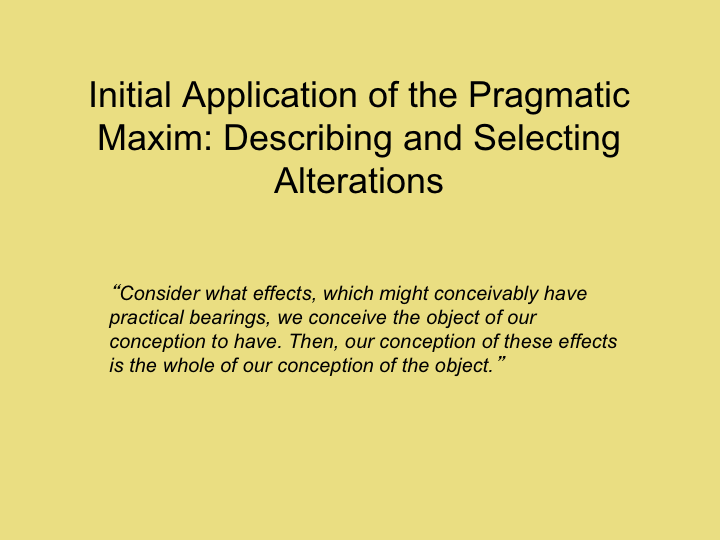 To decide whether a correction is critically significant, the following maxim, inspired by Peirce’s own pragmatic maxim, is applied: consider whether the change of intention possibly manifested in the alteration produces an effect which might conceivably modify a reader's perception or understanding of the altered passage; if there is any such conceivable effect, then the alteration is critically significant. Given this selective process, there are some manuscripts for which we do not publish an alterations list, even though they do contain alterations recorded in our master files. After examining different linear methods based on special symbols for insertions, deletions, transpositions, and the like, we settled on a modified version of the method created by Fredson Bowers (Studies in Bibliography 29 : 212-264). In W5, we embedded the entire record of alteration within the transcription in a close approximation of the Bowers method. 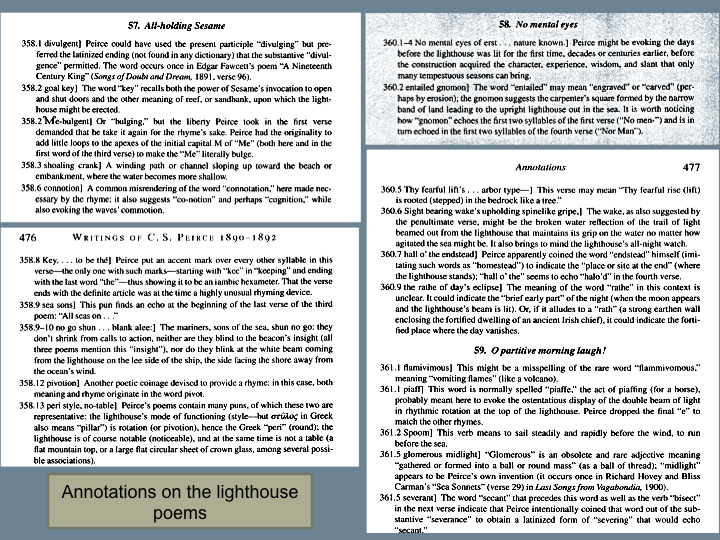 In subsequent volumes, the embedded alterations have been replaced with hypertext links. 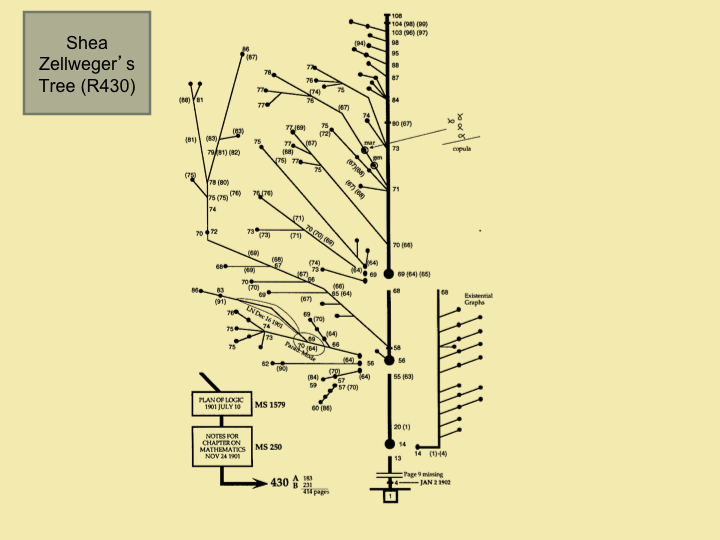 Peirce’s pre-copy-text layers of superseded text are tagged into the copy-text at the exact points where Peirce canceled or revised them; this alteration record can be displayed in a more-or-less genetic text format, or represented by place-holding "tags." 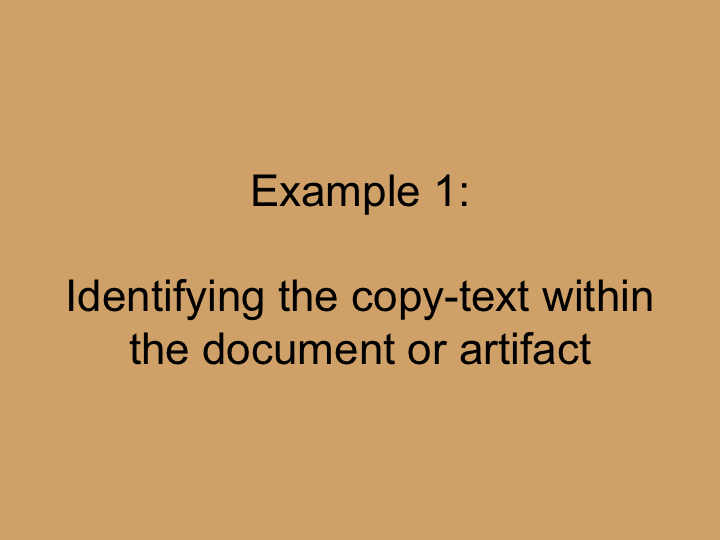 Emendations and regularizations are marked on a hard-copy printout as before, but they are imposed into the electronic copy-text file through the same hypertextual process of tagging. In the same way, textual notes, content annotations, and chapter headnotes can be tagged into the edited transcription. Some or all of the hypertext tags described above can be suppressed (hidden) for ease of proofreading; all hypertext-linked text as well as the tags themselves are suppressed when the document is laid out for print publication. 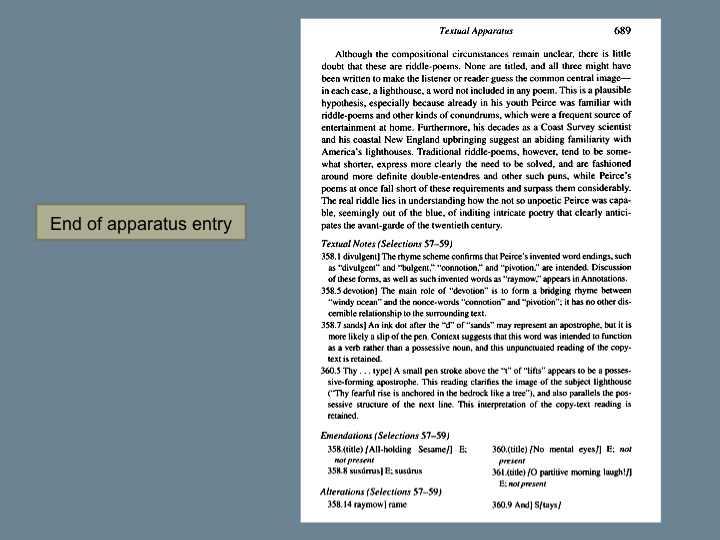 The suppressed apparatus sections and annotations actually remain a part of the copy-text document--in terms of production, this is the most important technological step forward to date. These scholarly components can be assembled in the distinct sections required of a critical edition, keyed to camera copy of the edited texts, and prepared in turn as backmatter camera copy. The addition in 1997 of a technical editor and the subsequent transition into a hypertext editing environment have made it possible to deliver camera-ready copy directly to Indiana University Press. In the past, the entire text of each volume had to be sent to a third-party compositor and revised at considerable cost before presswork began. The 1998 publication of the second volume of the Essential Peirce, a non-critical edition, provided the prototype experience for in-house camera-ready production; the procedures established in that work are already being used to save time and money in the preparation of new volumes of the critical edition. The Peirce Edition Project is very happy to announce that it has a brand-new website! It has a new address: www.peirce.iupui.edu, but it also retains the old address, www.iupui.edu/~peirce/. Our new website has been completely redesigned in order to make it easily navigable and readable. It provides far more information, for the most part either new or rewritten entirely. Not every corner of the site is finished yet, and we are adding new elements every day. Everything important is in place, however, enough so that you should find your visit rewarding. The site’s structure is distributed among eight tabs. The first tab, “Project,” explains in detail our reconceived mission, describes our history, identifies staff members, lists the members of the advisory board, and describes the kind of activities we assign to graduate interns. We will later describe our collaborative initiatives. The second tab, “Edition,” consolidates a large amount of information regarding each of the volumes we have published in the Writings of Charles S. Peirce series, as well as the two-volume The Essential Peirce. Each volume is presented through an “overview,” and accompanied by its table of contents, the text of its introduction, an updated list of errata, and other elements when available in the case of a few volumes. The overview of the second EP volume charts four itineraries through EP1 and EP2 that researchers and teachers will find useful when planning a course or a line of study. The third tab, “Peirce,” provides various kinds of information about Peirce himself. Its content will be refreshed and grow over time. The fourth tab, “Methods,” provides a comprehensive tour of our entire editorial operation, under nine chapters. We describe our workflow, the principles and methods of manuscript organization, copy-text selection, transcription, and critical editing. The aim is to make our operation more transparent while also educating visitors about the many complexities attached to a high-standard scholarly edition. The fifth tab, “Resources,” is intended to describe all of our holdings so that visiting researchers know what resources they may expect to consult. Some resources are available online, such as the published papers and the Robin Catalogue (whose rights Richard Robin gave to PEP). Those holdings include many of the various components of the Max H. Fisch Library, and the Project’s extensive archives. The sixth tab, “Research,” describes the Project as a research center long renowned for its welcoming plenty of visitors. We describe the policy for visiting the Project, salute our current visitors, list with much appreciation the names of our past visitors, and explain what the “Peirce Seminar Series” is all about, while also listing the names of all past presenters along with the title of their presentations. The seventh tab, “Publications,” makes available several documents we have produced over the years that reflect on various parts of our work. This area will also grow over time. It also presents the Peirce Project series at Indiana University Press. The final tab, “Technology,” is most important. Here we describe our several initiatives regarding the electronic future of the edition, and explain in detail, often with illustrations, how we have been planning and developing STEP, STEP Tools, and CORPUS. We also present two applications we have developed: LiveIndexer (a sophisticated back-of-the-book indexing program loaded with many functionalities), and PithMaker (a fun application that can be downloaded for free!). Peirce’s spirit inhabits the entire website. Nearly every page opens or ends with one or more quotations that relate to the content of that page evocatively. 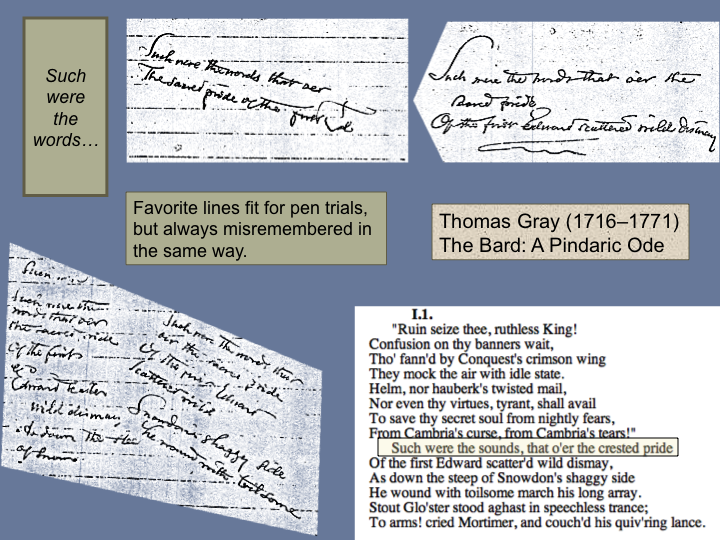 In addition, the left side of every page displays tokens of “Peirce’s pith”: a random pithy statement or aphorism that changes each time one moves to a new tab or refreshes a page. 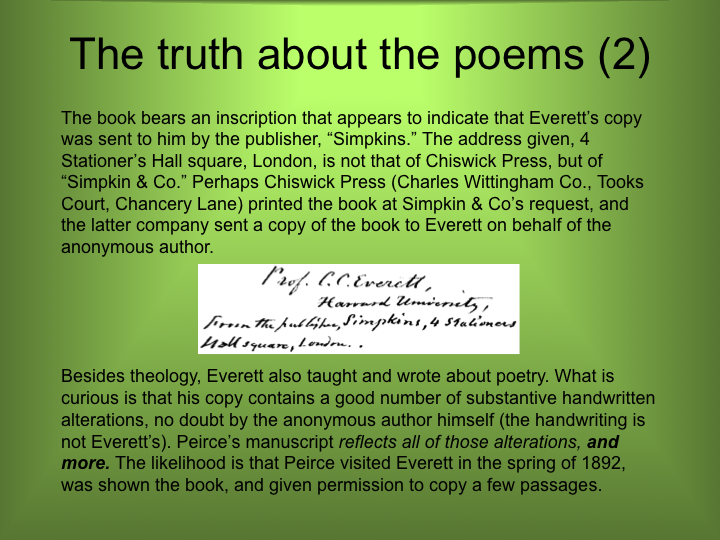 Website visitors are encouraged to click on “Peirce’s pith” to increase pithiness in the world. We hope that everyone with an interest in Peirce will visit and appreciate our website. Please feel free to send us suggestions and ideas on how to keep improving it (cpeirce@iupui.edu). Do not forget to click the refresh button because the content increases or changes rapidly. We will soon add many links to the rest of the Peirce scholarship. As always, we count on your support and thank you for it. 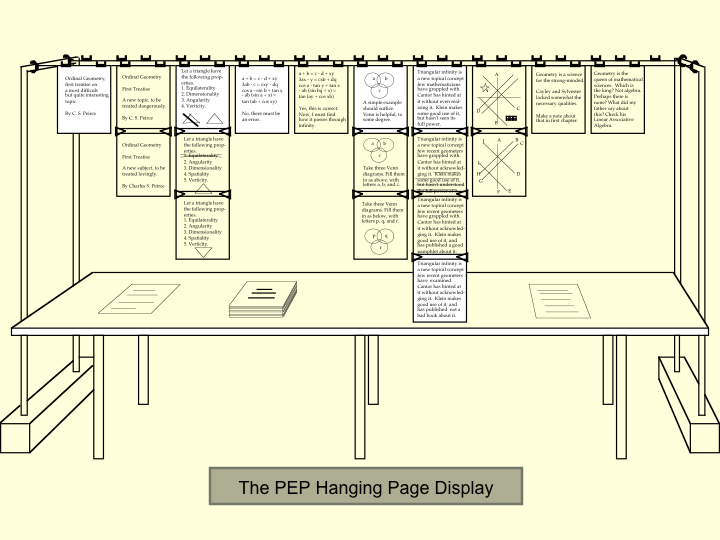 The Peirce Project is hard at work, with revived pep!